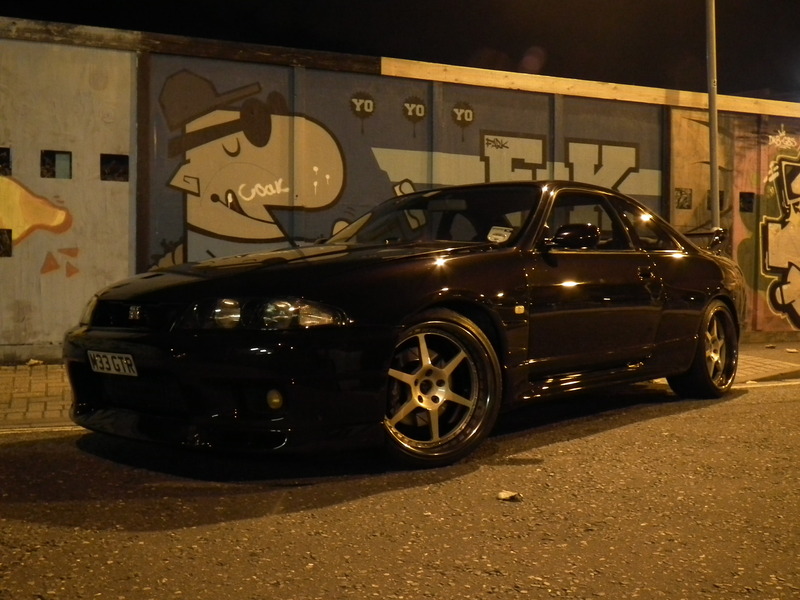 Being that my last R33 was quite heavily body kitted up (by original owner) and my previous Mazda build was also very modified by me. I felt with this one I would concentrate more on the tuning side and keep it looking a bit more standard. Kitting a car can be hard work and time-consuming and at present free time is not something I have a lot of! The car was completely standard when I got it.The first thing you notice is you can crawl under the car and work on it without the need for a jack! So first and foremost it was going to need lowering. 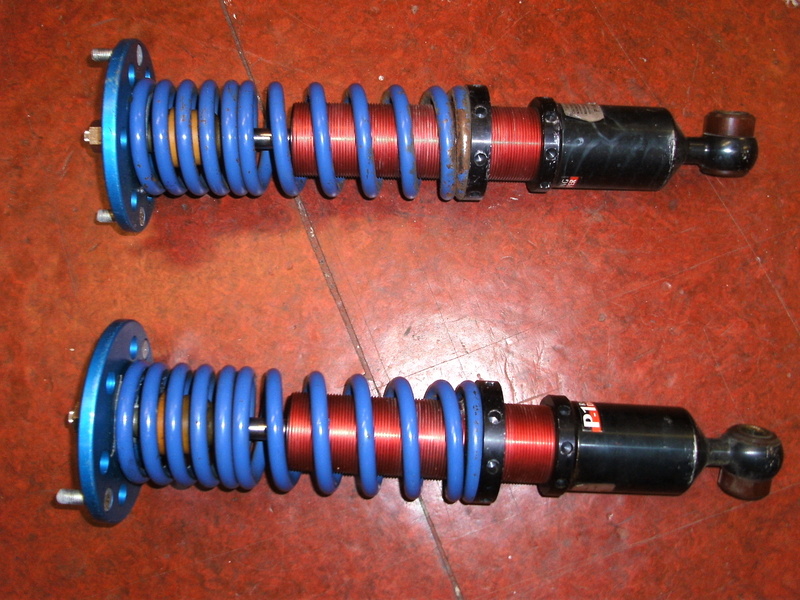 For this job I managed to find some Buddy Club fully adjustable shock absorbers with pillow ball upper mounts for a very good price. Having fitted them they are possibly verging on a little stiff for road use but you only notice it on a bumpy back road. 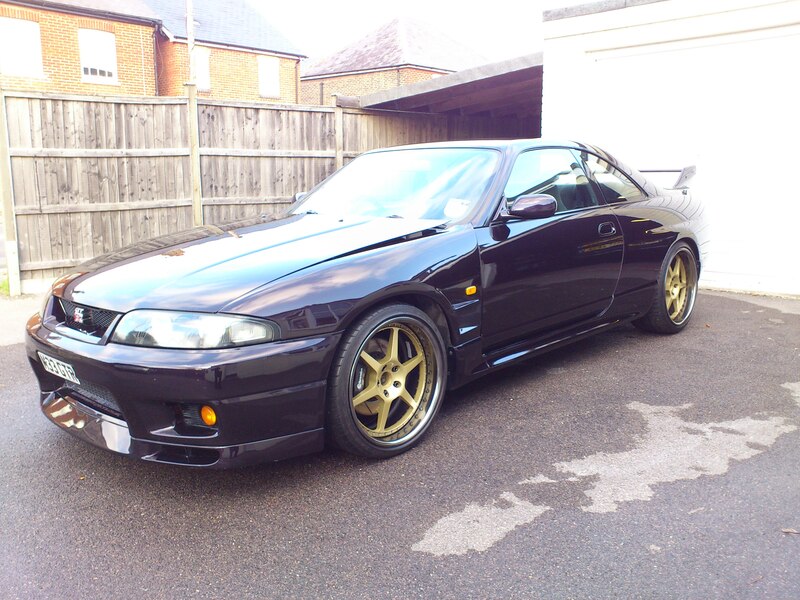 So far I have lowered the car a good 25mm and there is still room for a few more! The car certainly feels very positive with them on an goes any direction you wish to point it! The next item on the list would have to be wheels! 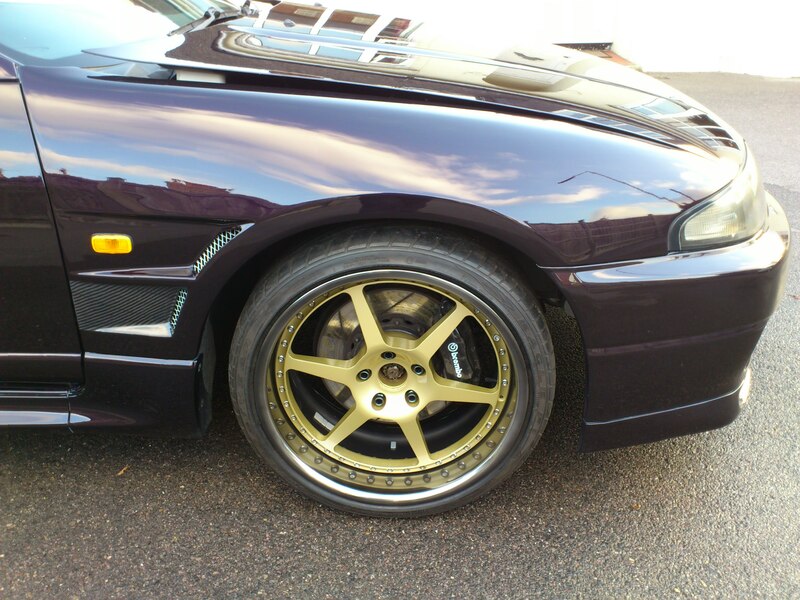 No car is complete with a lovely set of rims and as I have said before wheels can make or break a car. These are always one of the hardest things for me to find. Mainly because I have very expensive taste but too small a wallet to back that up! So plenty of hunting around! In the end I found some that I thought would do the trick. 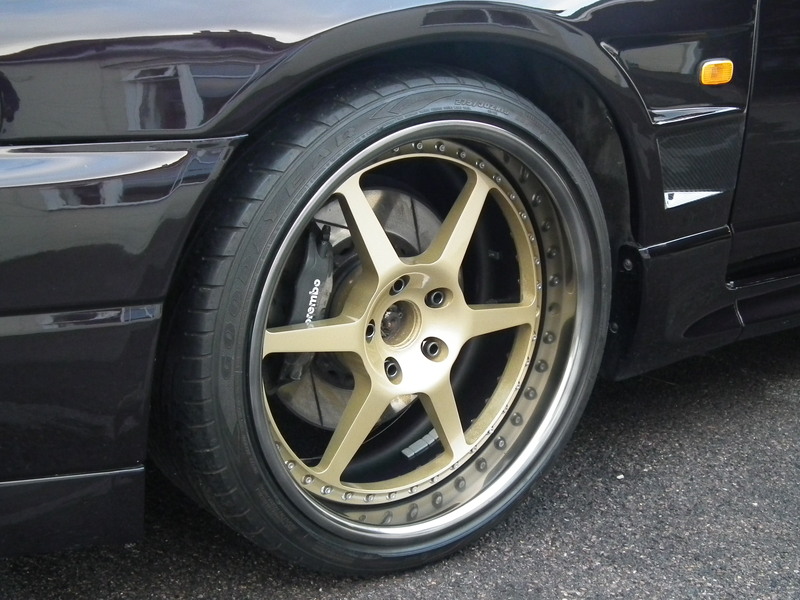 Some HRE 19″ rims. Not that there is an intentional theme with my taste (God forbid!) 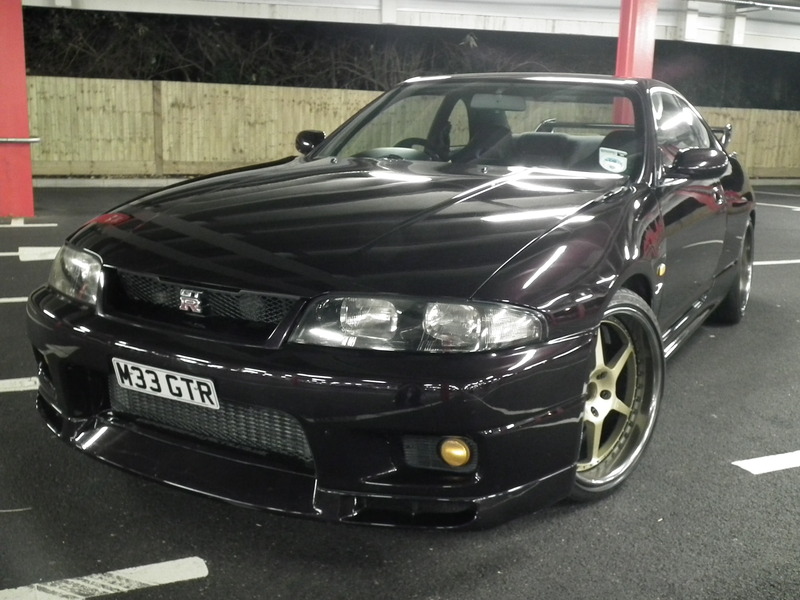 but these are the same rims on the silver R34 GTR in Fast and furious 2! Again I did only find this out after I had bought them and googled the rims to get some info on them! 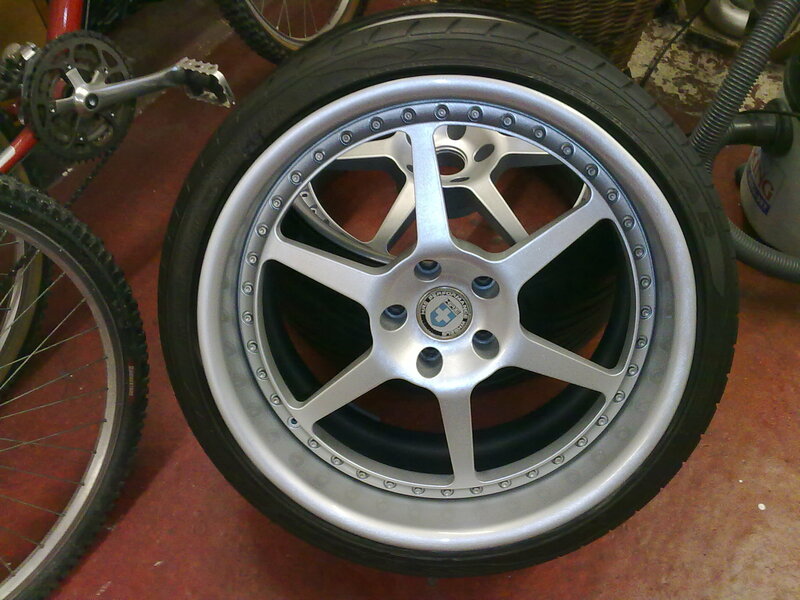 The wheels had been refurbished but painted all over silver rather than having the polished lip they came with. 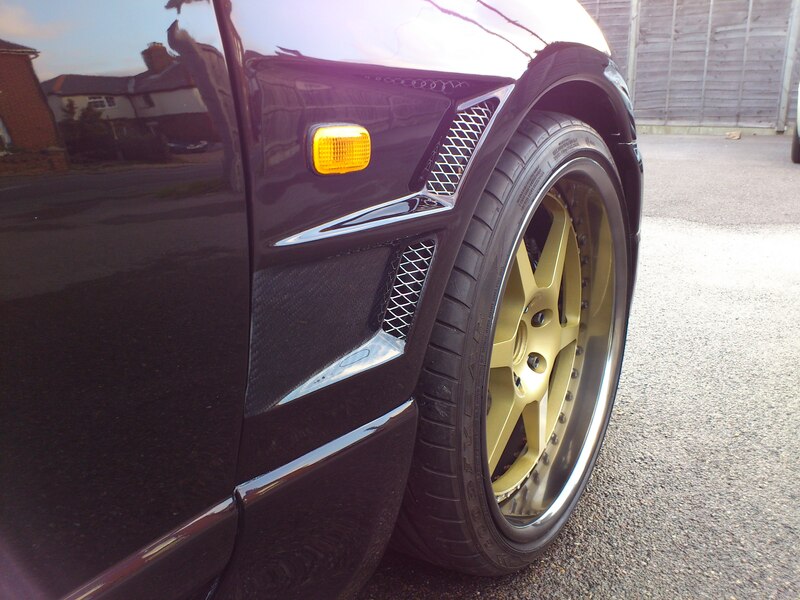 Plan is to strip them down and polish the lip again and possibly repaint the centres gold or hyper silver. I will update this page when I get around to it! So it was time to think about the bodywork. 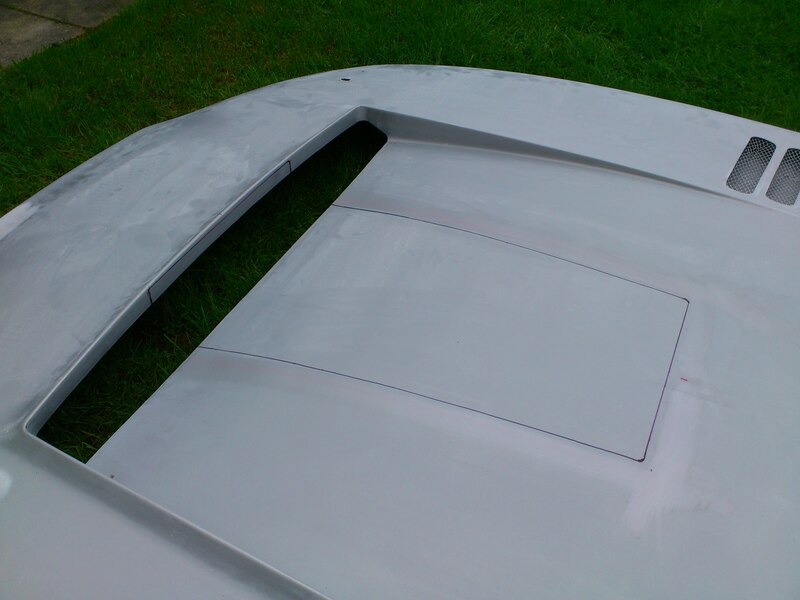 As it was there were a few bits of TLC to do like repainting the driverside door and repainting the roof! 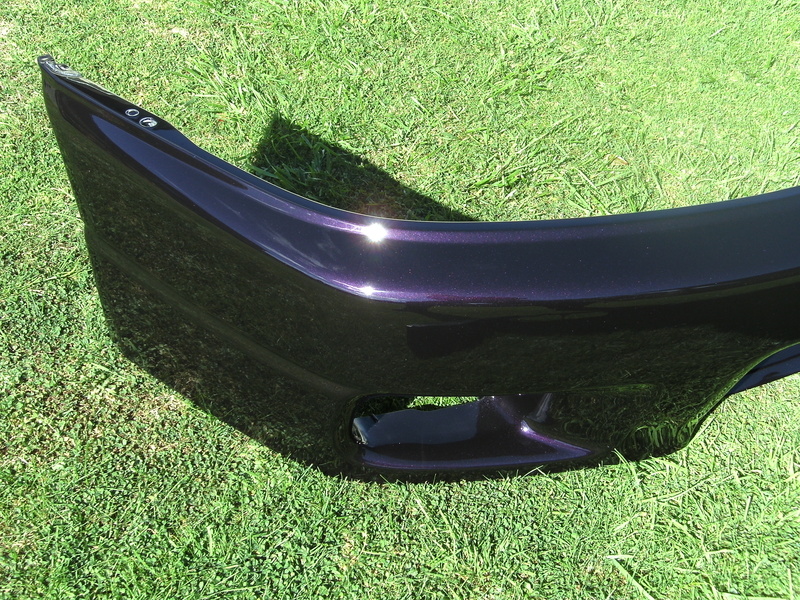 Also the front bumper was chipped to hell so that would be repainted and the lower section colour coded with the midnight purple. 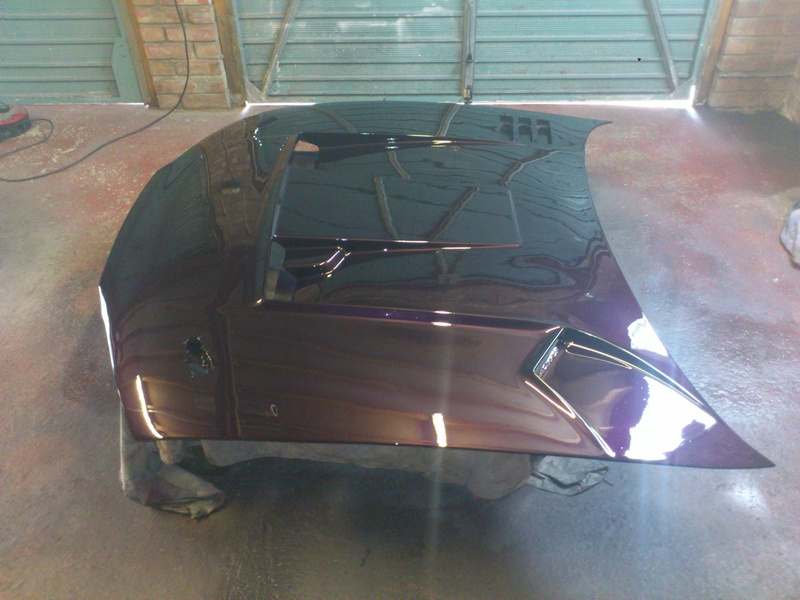 The purple is such an amazing colour with a good flat and polish the entire car gleams with such depth of colour. Well worth the elbow greasy going over it all! As I said before I did not want to modify the bodywork too much. 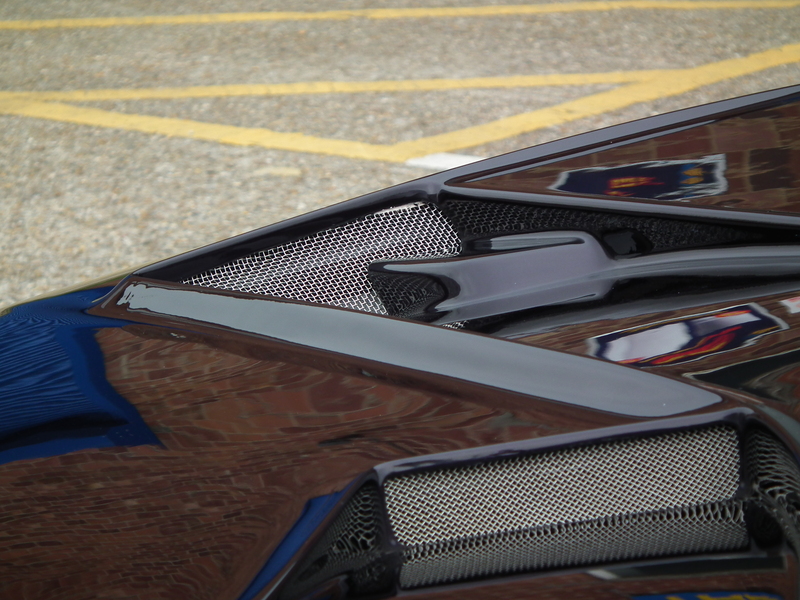 However I did fancy getting some vented wings having seen them on another car. 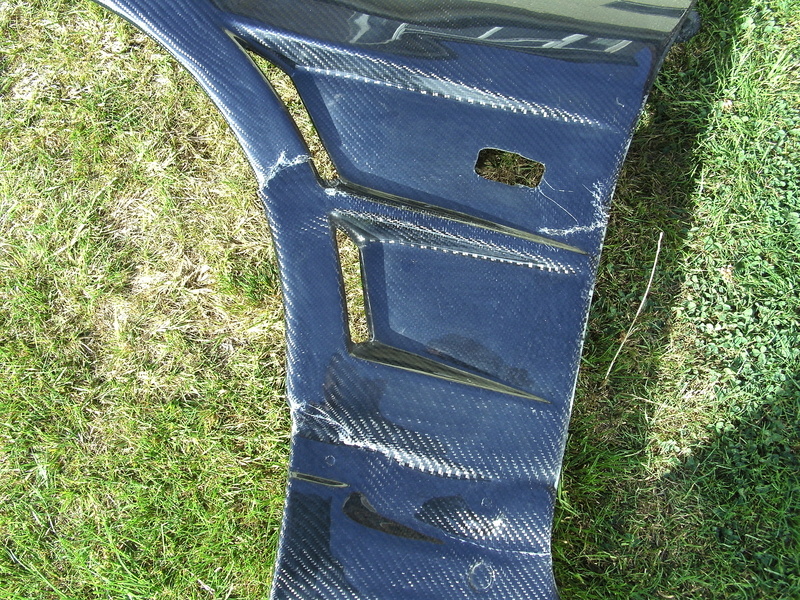 After keeping my eyes out for some time a pair of damaged carbon ones came up. 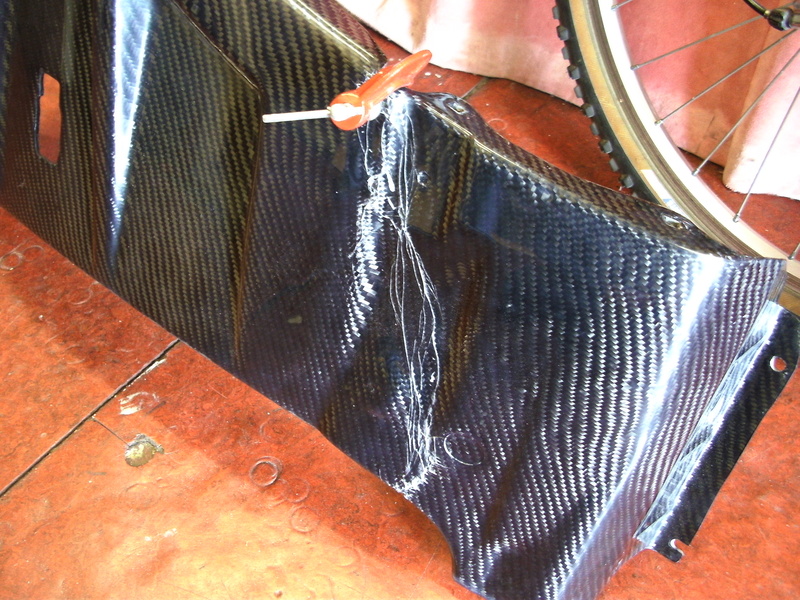 I was pretty confident I could repair them as there were no bits missing and I did not want to leave them raw carbon all over so I went for it. 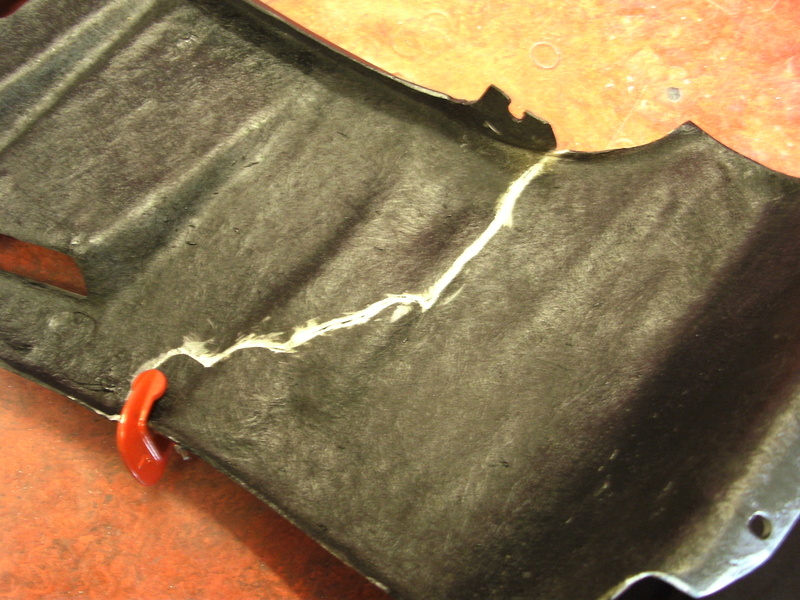 I vee’d out the cracked sections being sure to remove any loose resin and fibres. 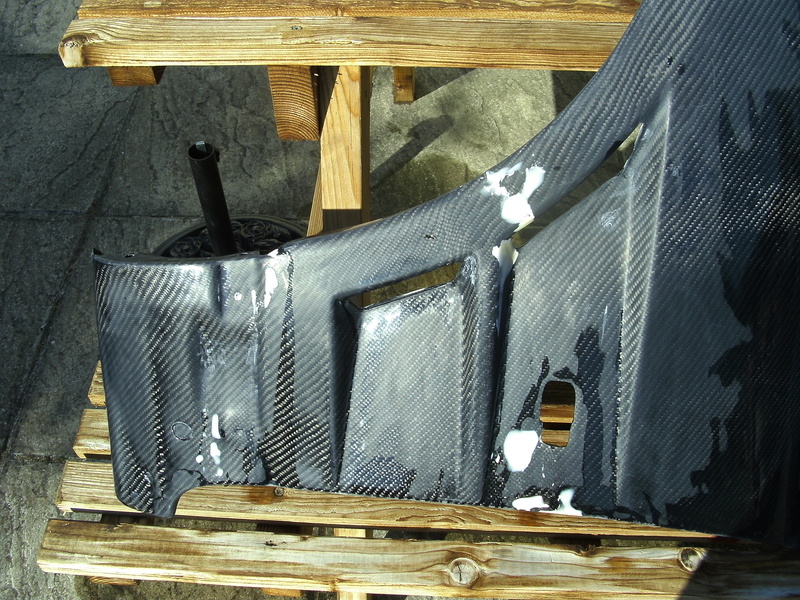 I then wet the crack out with resin and backed up the parts with glass fibre to reinforce them. After this the outside was flatted off and filled where required. With the filling and prep of the wings complete they were now ready for painting. 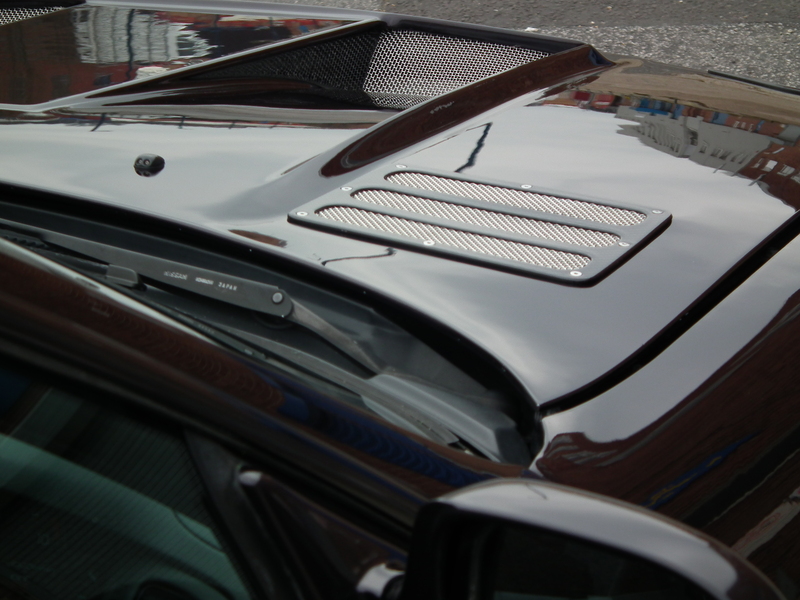 I decided I wanted to show a little bit of carbon so opted to mask out around one of the vents to keep it subtle! 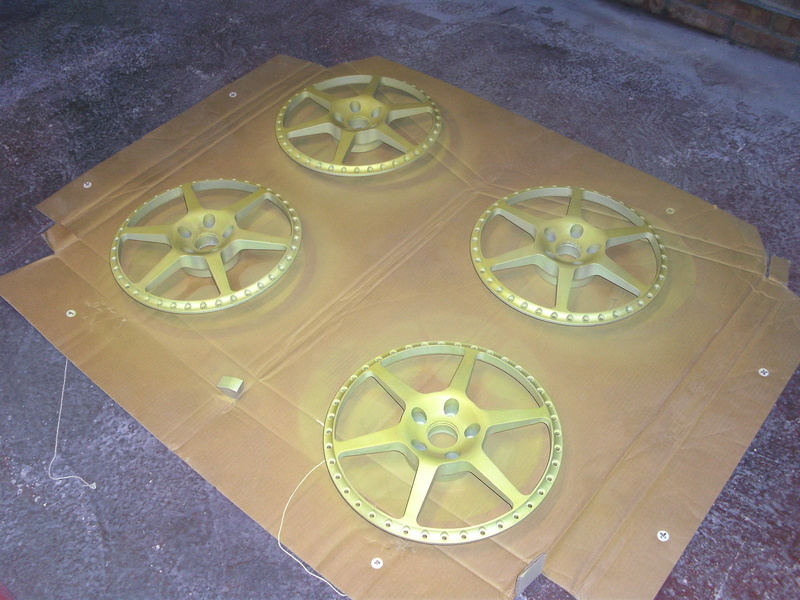 Being that the wings were easily transportable I decided to take them into work and use the spray booth for a change! It is so much easier painting in a proper booth! I was very pleased with the results. 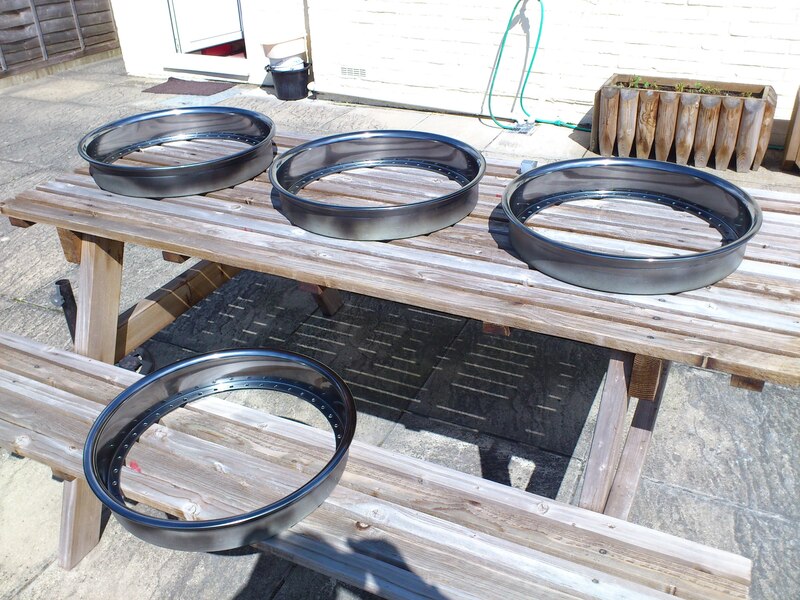 Only a quick polish needed and they were ready to fit to the car. 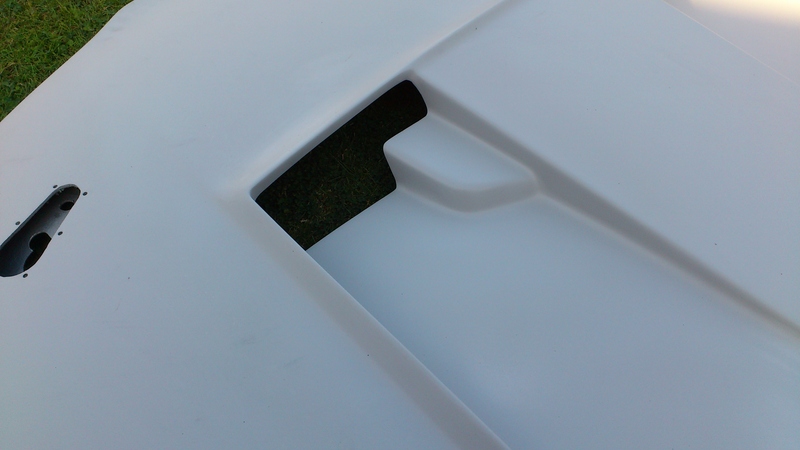 The bumper was quite painful to polish with all the nooks and crannies to get into. 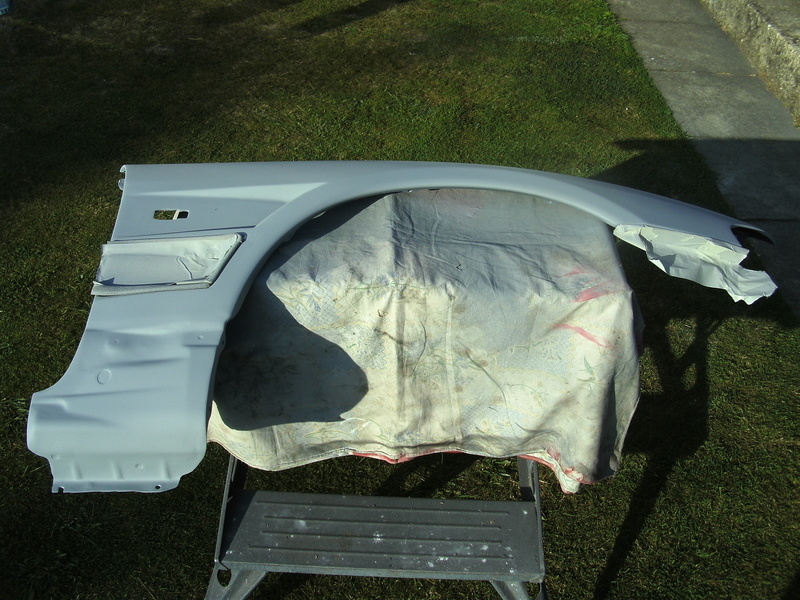 Plus I sprayed that in the garage at home and just did not get as smooth and glassy a finish off the gun. That said it was nothing that wasn’t easily flatted back out! After all that polishing the front end was ready to go back together! 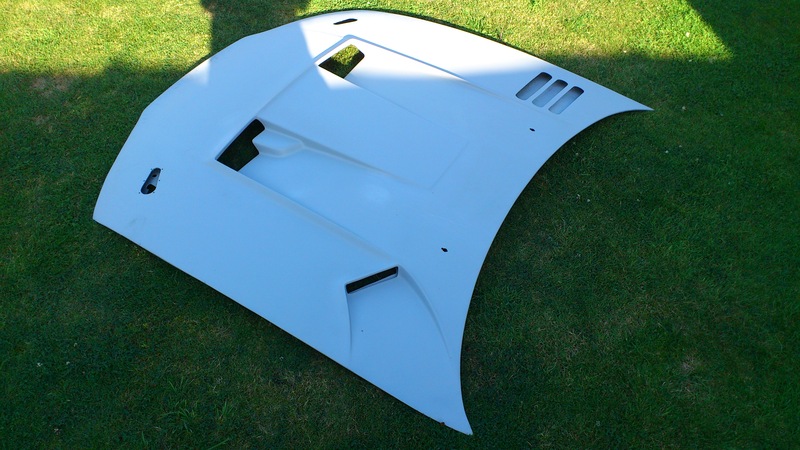 The remaining plans I have for the bodywork are to get a vented bonnet. More for necessity than looks! Although some look nicely aggressive. 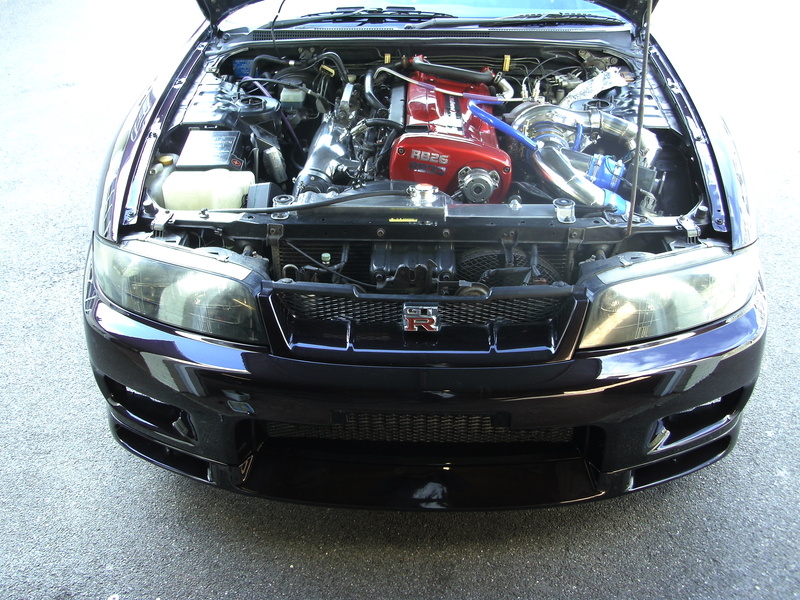 With the taller engine and top mount turbo it gets very warm under the hood. As a temporary measure I have had to prop the bonnet up on spacers to draw the warm air out of the rear which actually works a treat! 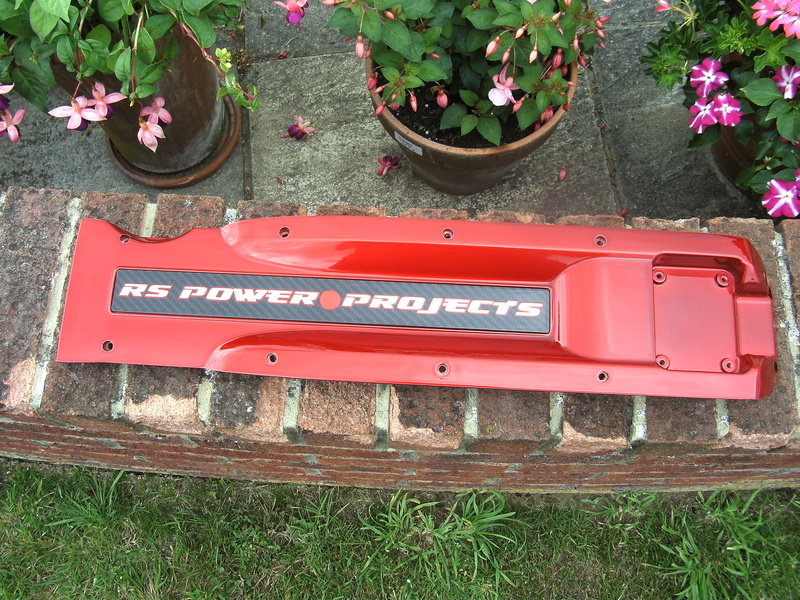 Also I am torn between getting some top secret style rear bumper spats or a complete bumper of sorts! I will add details later down the page when I make my mind up! Just to give you some eye candy (pardon the pun – you will see!). 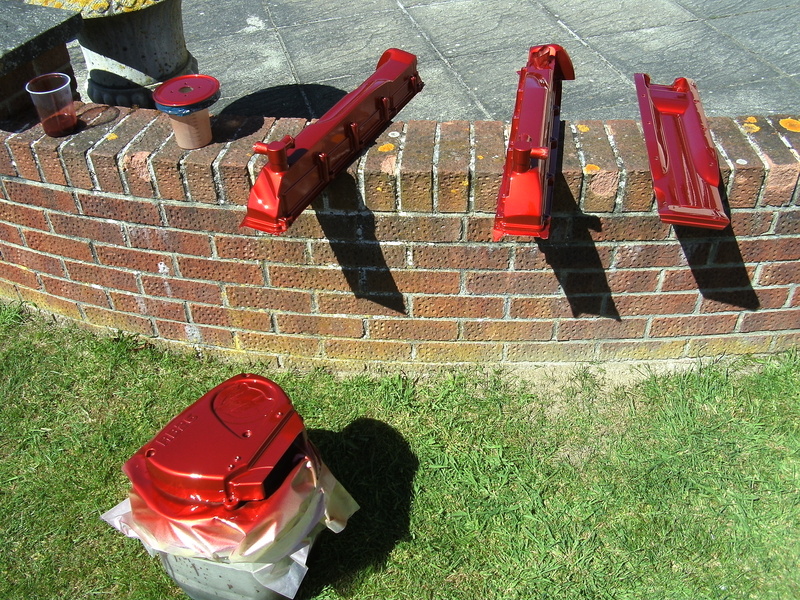 As you will have seen if you have read the engine build section I painted up my cam covers and bits with candy apple red to brighten up the engine bay. 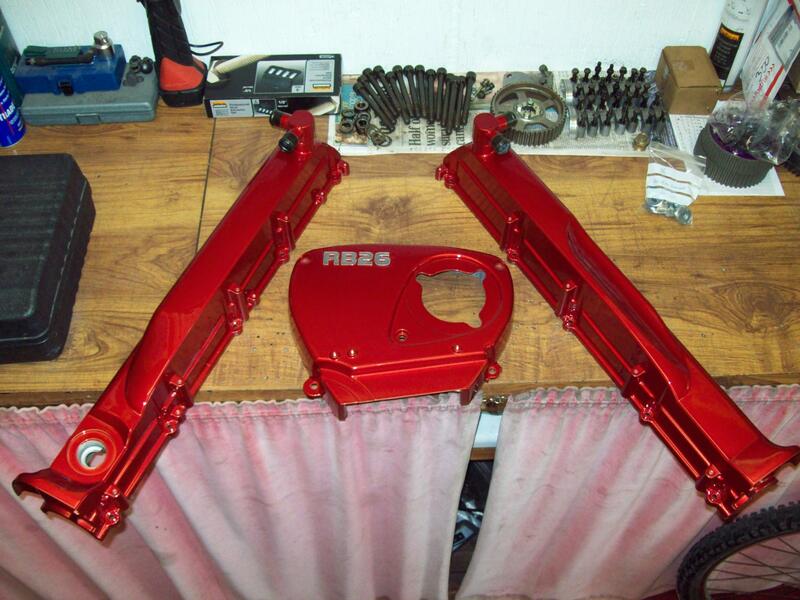 I think it is a stunning color colour and used a lot on custom bikes and hot rods. 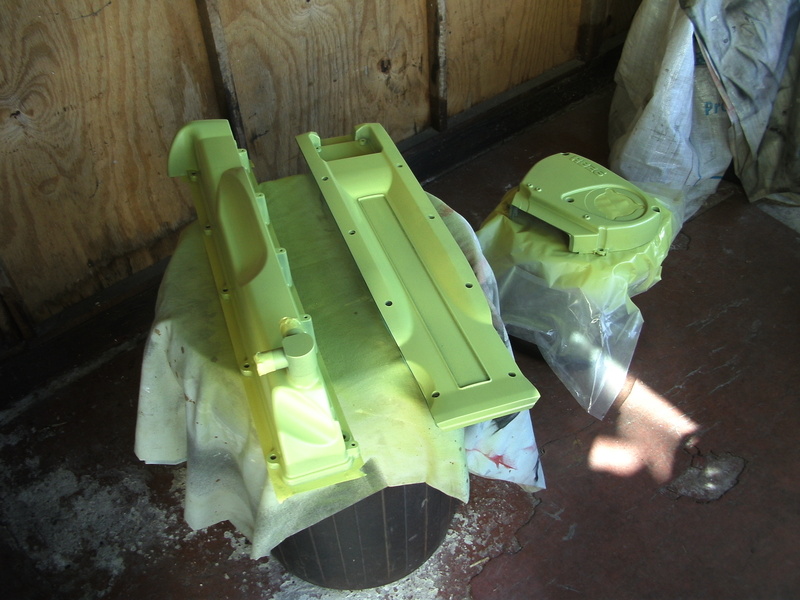 This is a 3 stage paint process. That means that after primer (I also added in a layer of etch primer) you have to apply a silver base coat (other colours can be used to create different final tones), you then apply the candy red which is a semi translucent top coat. On top of this to protect it you apply a clear coat.. et viola! So to top off the stunning red covers I had some stickers made and knocked up a carbon plaque at work to mount them on. A few coats of lacquer and a flat and polish later, I had a tasty looking badge to sit in the coil pack over inlay. Having found out my one way valves were leaking on my OEM set-up oil breather system I decided to fit an external catch tank. Here are a few quick shots showing the catch tank set-up and you can also see the Q45 MAF’s fitted with the Apexi air filters using an adapter I had machined. 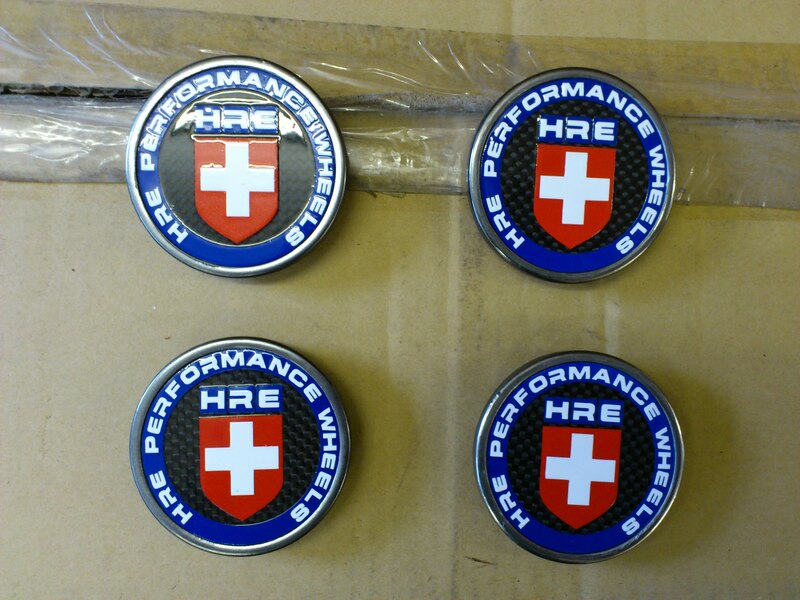 My HRE’s were nice enough for sure but just not quite shiny enough for my liking! The previous owner had refurbed them and just prayed them silver all over. So although they were mint condition they really lacked a bit of shine for me! After much debating I decided There was nothing for it.. 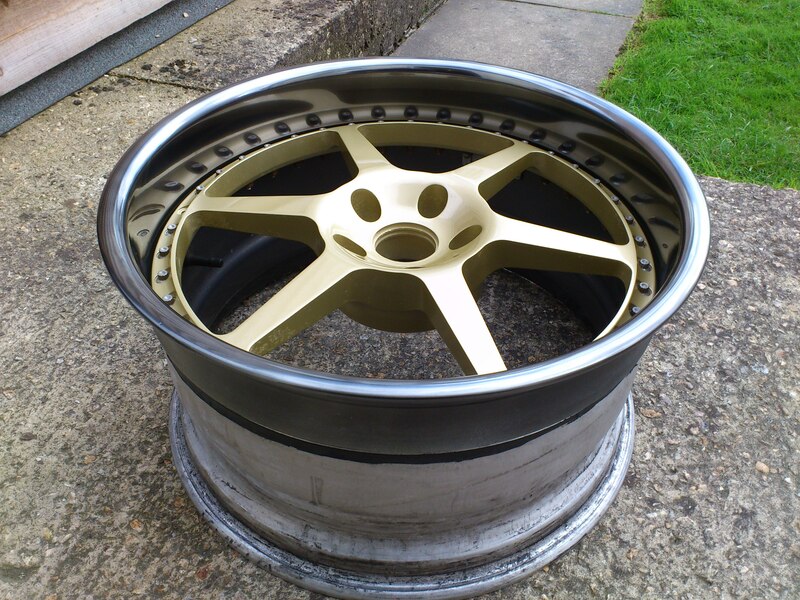 I would have to pull them apart and strip the lips back and plaint the spokes a nice gold or bronze or something!? 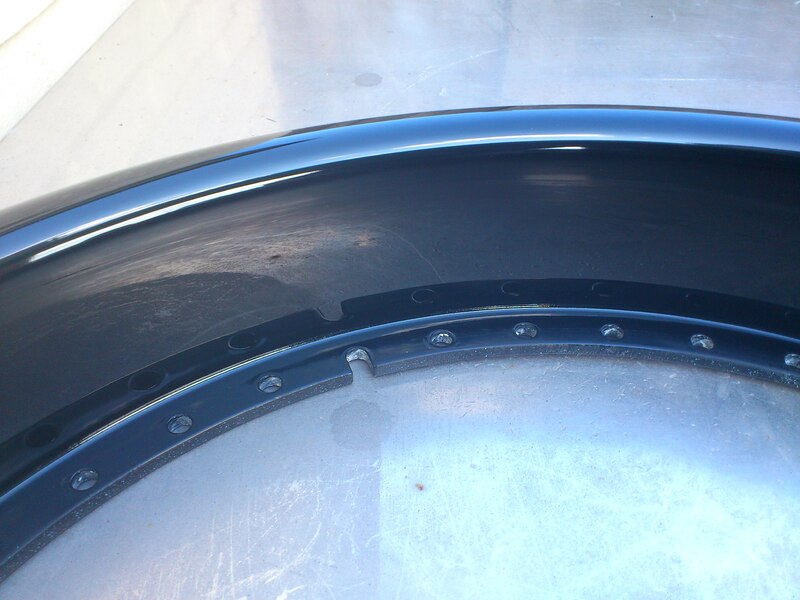 I had also noticed one rim had quite a large flat spot in it. So it would be a good opportunity to straighten it! 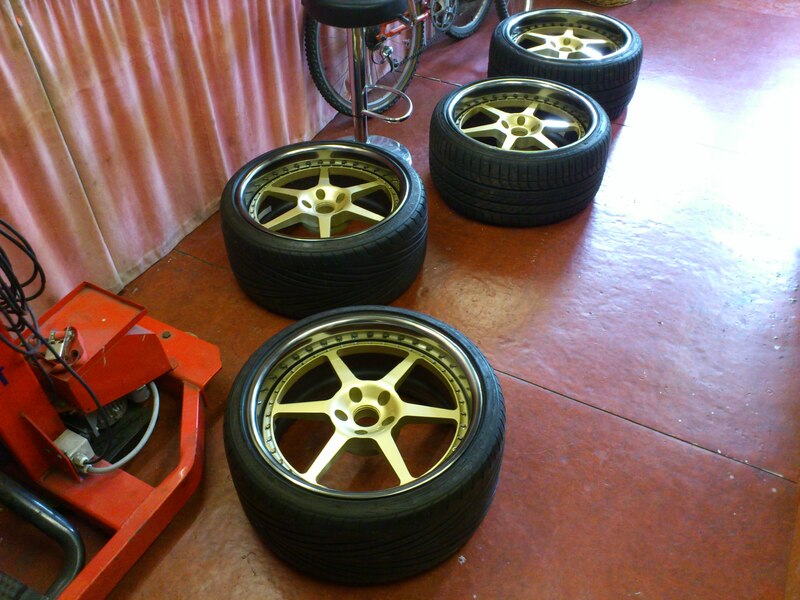 First job was to strip the tyres off and then disassemble the 3 piece rims. Once this was done I straighten the flat spot as best as I could with some forming tools I had made. 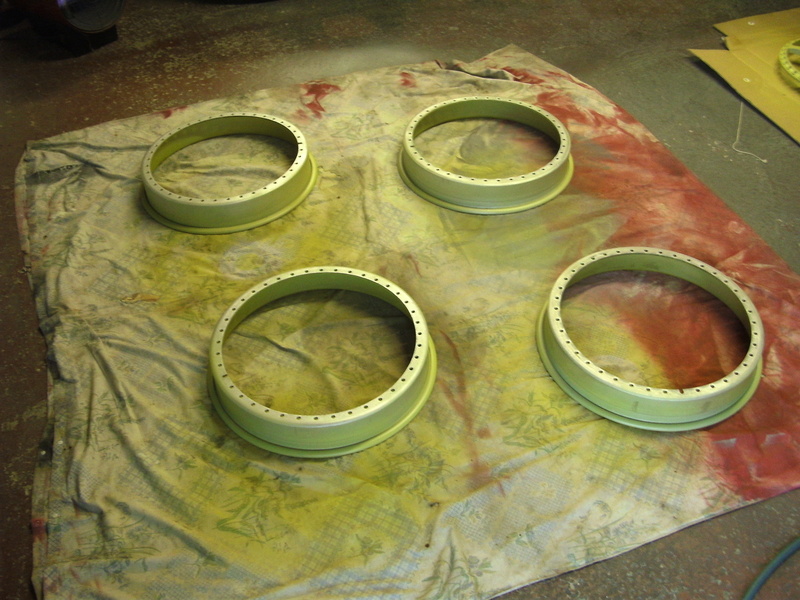 I then sent the rims off to be stripped. 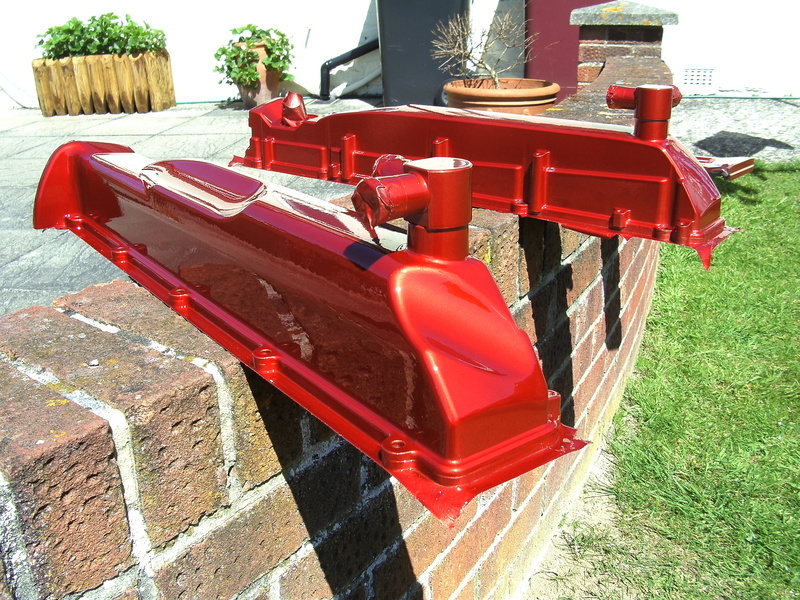 When they returned from paint stripping I quickly realised polishing the lips would not be an option and maybe this is why they had been painted. 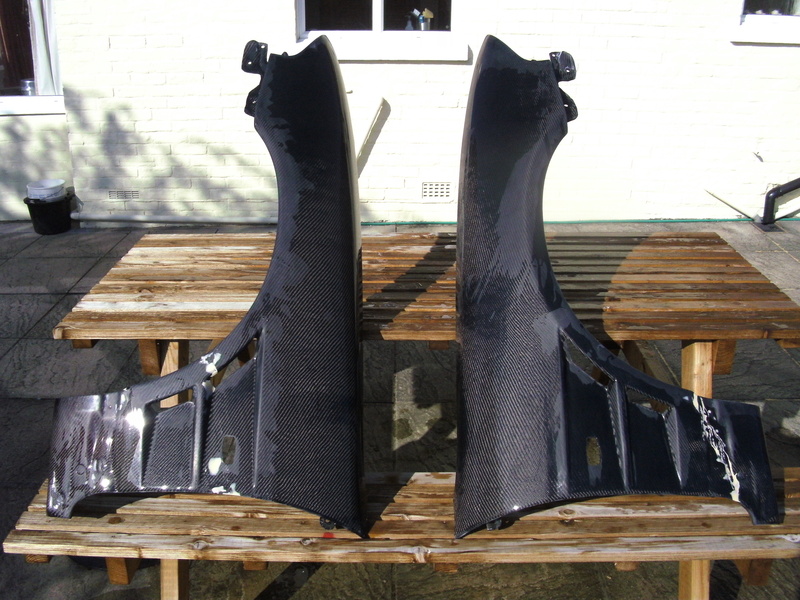 Most of the lips were very badly pitted and required very heavy sanding to remove the pits which I was not keen on. Plan B.. 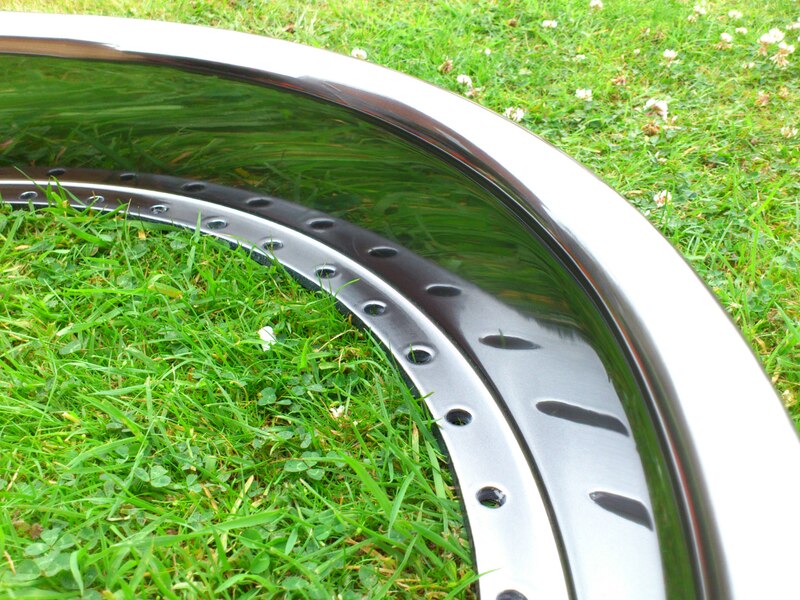 I would ring around and see if I could get someone to chrome effect paint them.. I could, but no one to local to me and it was going to start getting expensive. There was nothing for it but a good bit of old DIY! I had some special chrome spray I had tried to use before without much success. Liquid Chrome. So I contacted the supplier for some tips and quickly realised where I might have gone wrong previously. So I thought it was worth a shot again. 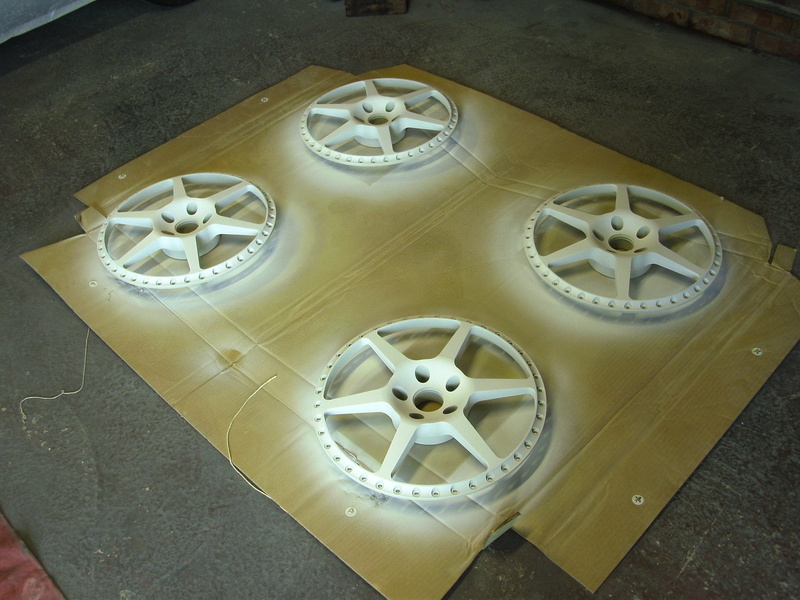 Liquid chrome, as with most other chrome effect paints, is a 3 step paint system. 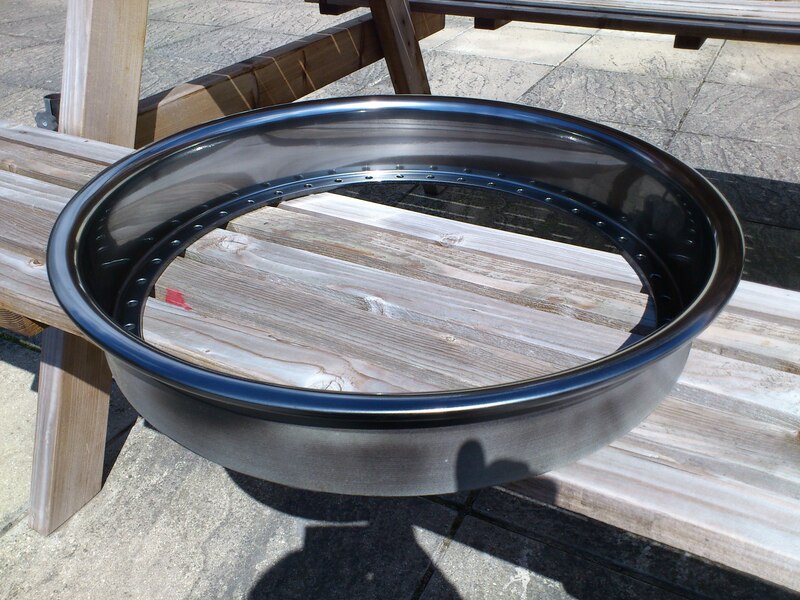 After priming the surface (and additionally in this case etch priming first as we are painting on to aluminium) it requires a very smooth high gloss black base coat. You then lightly apply the chrome effect over this. 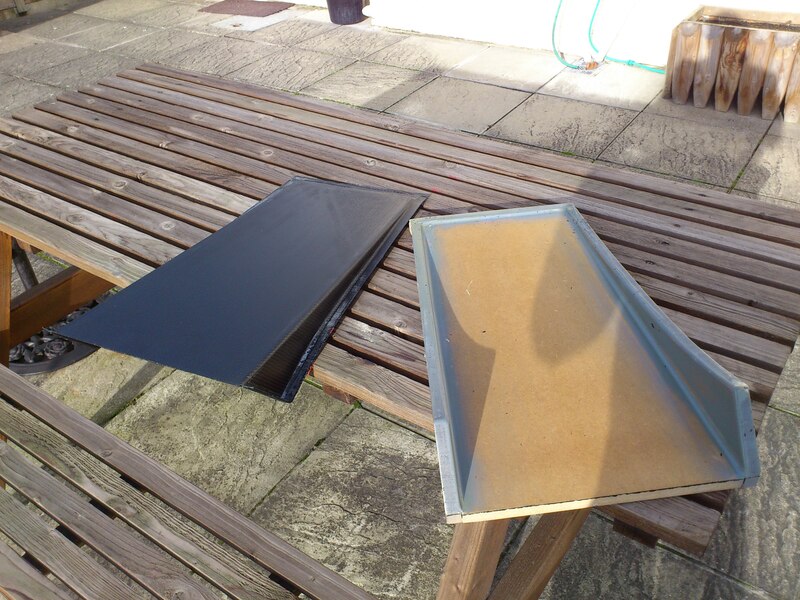 Once that is off you need to use an Ultra high solid lacquer to cover it.. 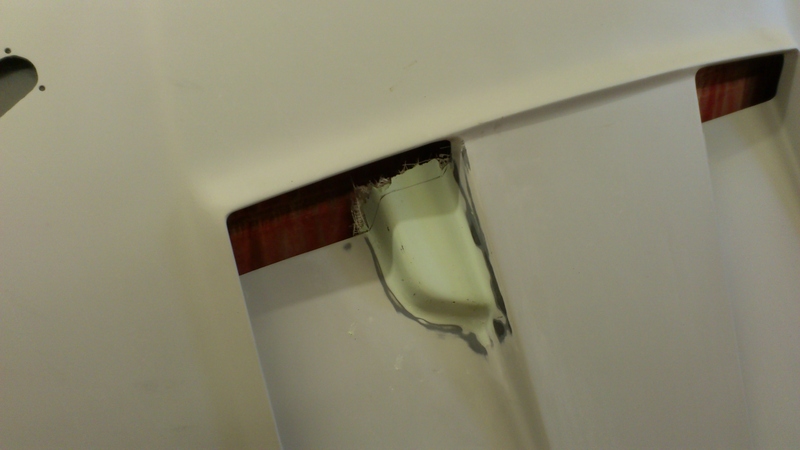 This is where it can all go wrong as too heavy on the lacquer and you kill the gloss. 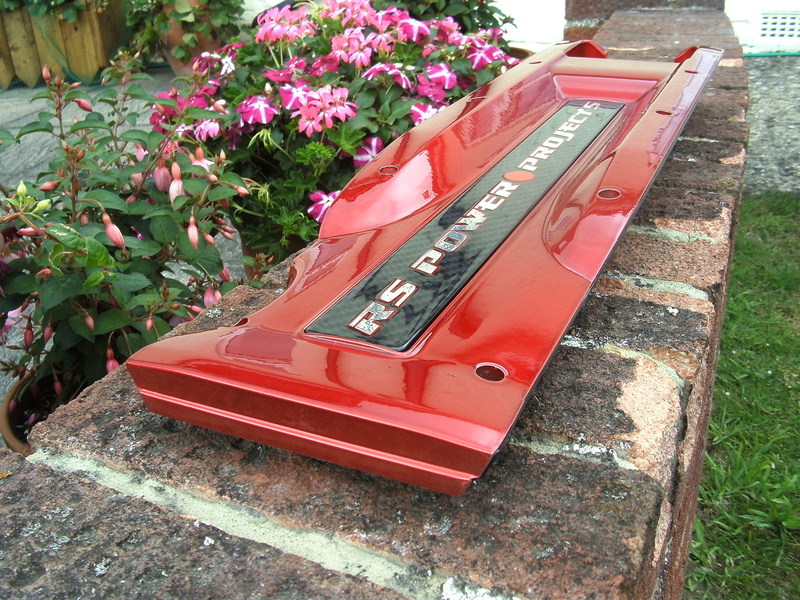 From what I gather you can get a better finish using a water based lacquer and then a 2K over the top of this. 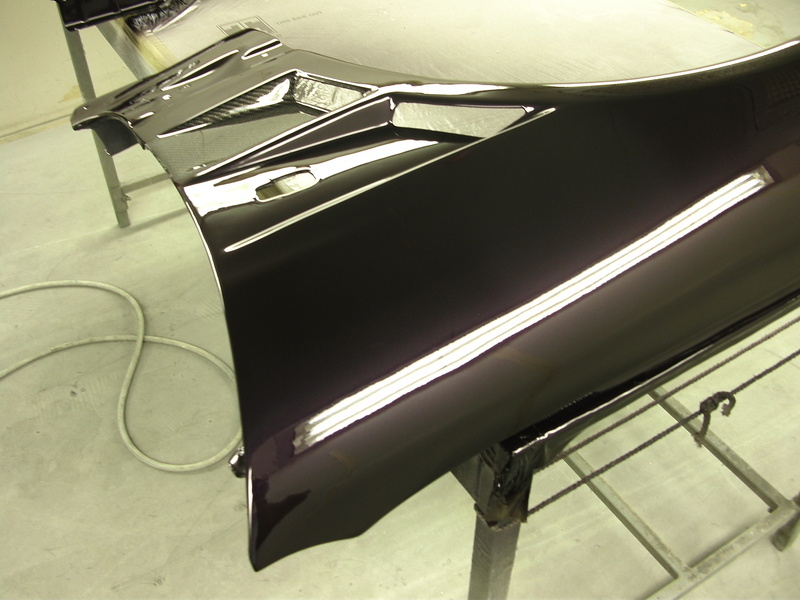 Applying the black is easy.. and if you don;t get it mirror smooth you can flat it back and polish it up with a silicone free polish to get the perfect shine. Applying the chrome effect is not too bad either. Just got to play around and get the gun settings right as you need very minimal amounts of paint coming out of the gun to get good atomisation and coverage. Undoubtedly I lost some of the shine at the lacquer stage. 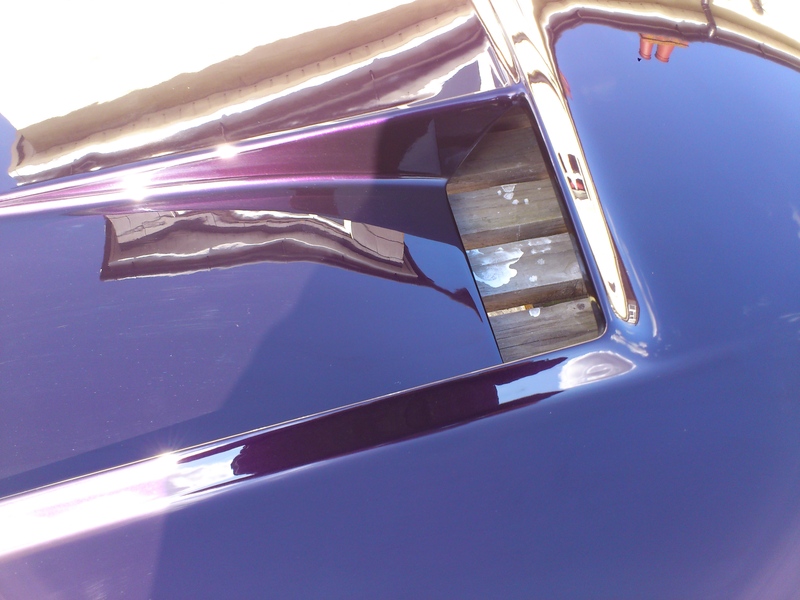 Going with a recommended Ultra High Solid 2K lacquer it was still very hard to get coverage without killing the shine and without it being dry as …. Still after a flat and polish back they came up with a very good result. Well I was happy anyway! 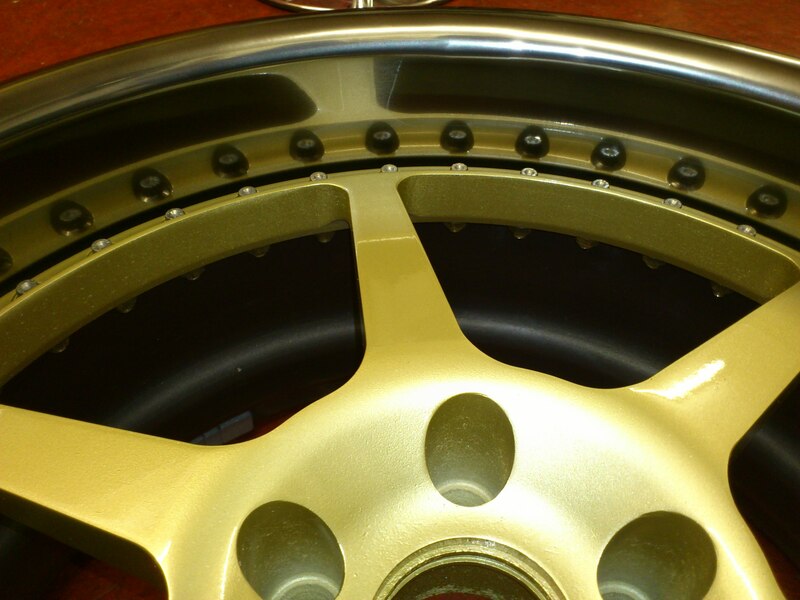 The spokes I decided to go with gold. I also happened to have some BBS gold in a tin. However I found this a bit garish so I toned it down with some silver to pale it out a bit. So with the Gold spray and everything polished up separately it was the just the pain staking job of cleaning every stainless bolt and fitting the rims back together! You might think I joke?! Oh no! I can tell you my fingers were sore after that! 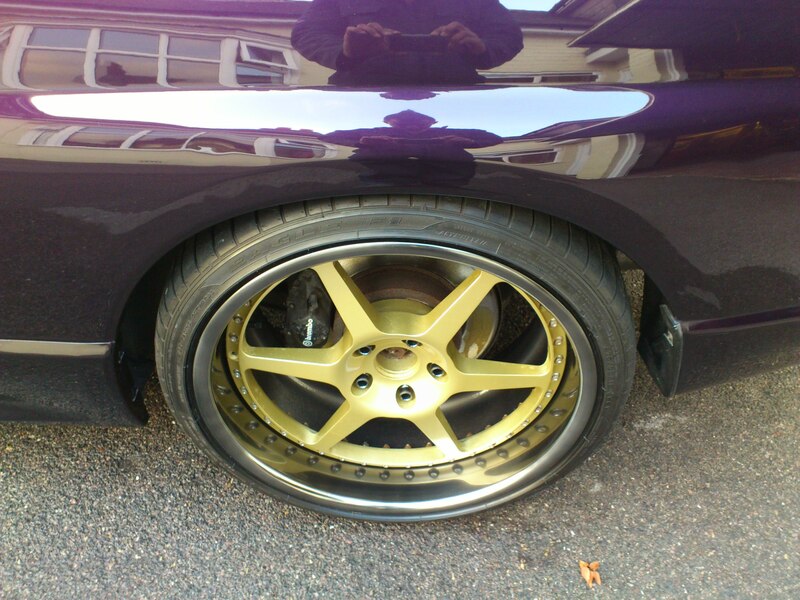 Finally with the rims built up the last bit was to get the tyres back on them.. Not a fun job.. 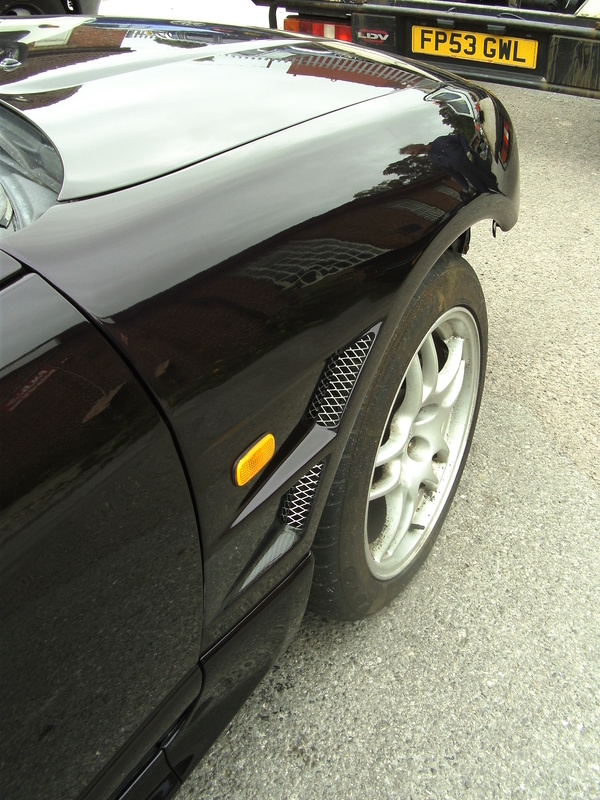 I carefully masked out all the lips to try and avoid any damage while fitting them and took them down to my local tyre shop. It took three of us to get the low profiles on without it spinning the rim on the tyre machine and ripping all the paint off! I think the poor lad doing it was bricking himself! I must say they looked sweet though! There was only one thing missing now.. Some subtle finishing decals and some refurbed centre caps! I did actually refurb the centre caps with the chrome effect paint but that didn’t look quite right. 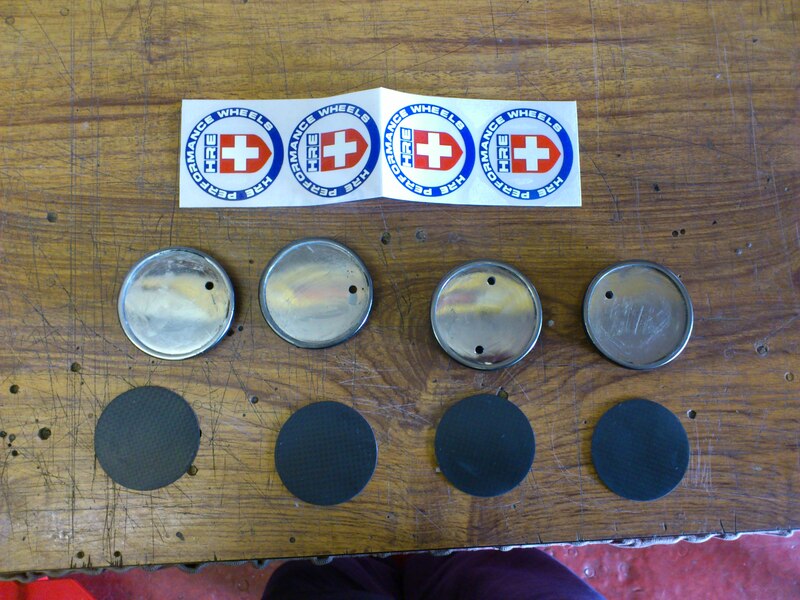 So instead I am in the process of making some carbon centre caps with some stickers to go on them. Hopefully I should get that completed soon so I can update here. 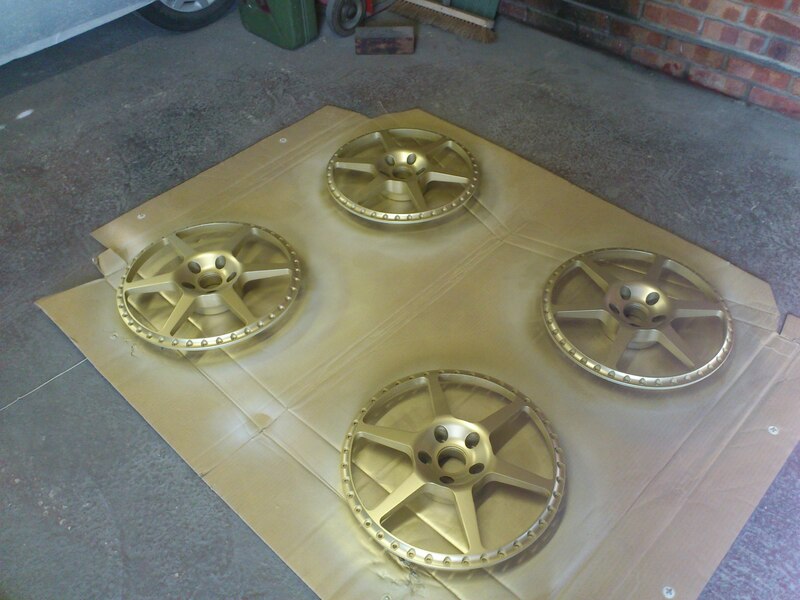 So for now here is a sneak peak of the wheels on the car! I also treated myself to some D1 alloy wheel nuts! I don’t normally allow myself such luxuries but hey it was a one off! Oh and if you are thinking the car looks shiny I had to do a little blow in on one of the rear quarters so I thought I would polish and wax the entire car while I was at it! I am sitting here typing this Feeling like have done a few rounds of Tapout MMA! So here is a little treat for you! I finally got my stickers through for my wheels so I could finish them and the centre caps. Using a little off cut of carbon fibre sheet from work I pulled out the corroded centres on my old HRE centre caps. 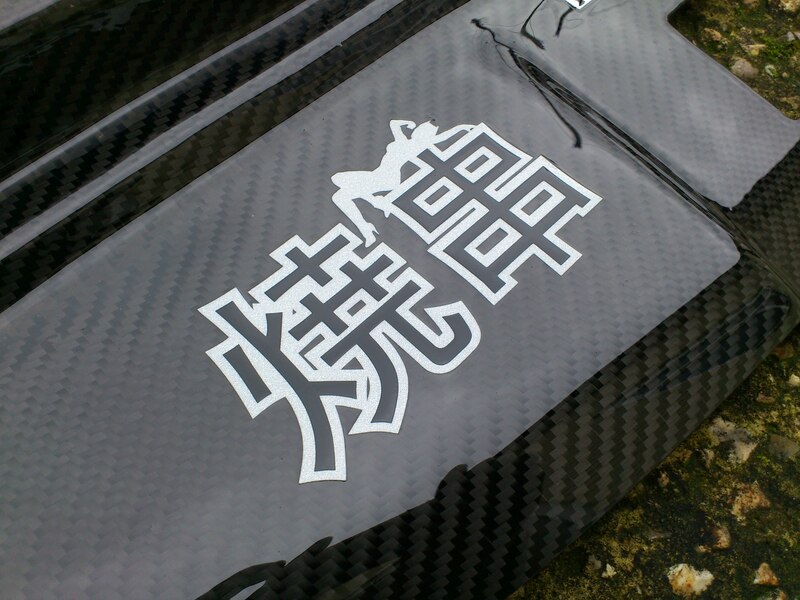 Mounted the stickers onto the carbon, Gave them a good heavy coat of lacquer an bonded them back into the cap housings. I hope you will agree they are a nice touch! 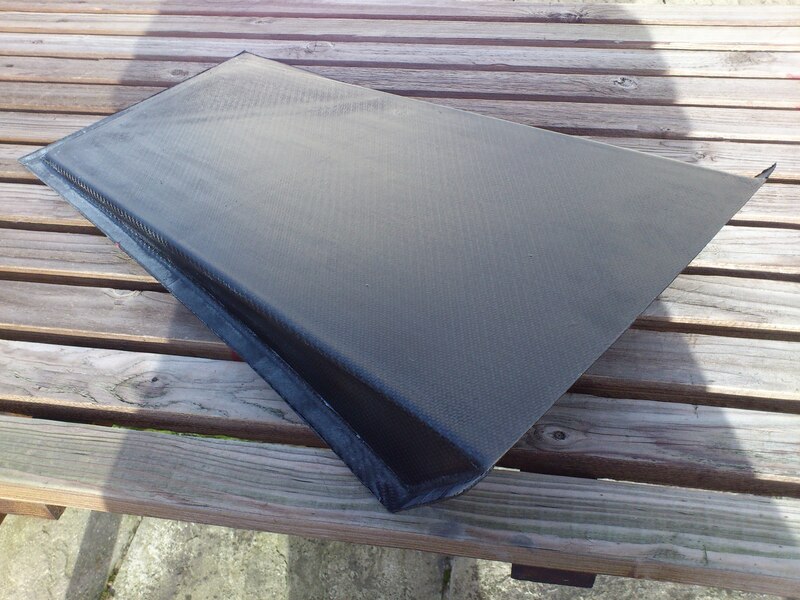 While I was looking out for something on the forums I accidentally came across a carbon cooling panel for sale which I had always wanted so thought this would make a nice addition to the engine bay and finish it off. I did the deal and when it turned up it was looking a little flat.. So I decided I would give it a new coat of lacquer and while I was at it put a few more little decals on it so it didn’t look so plain. Currently the car was sporting a rather chavvy looking propped up bonnet to try and give the heat from the large turbo somewhere to go. 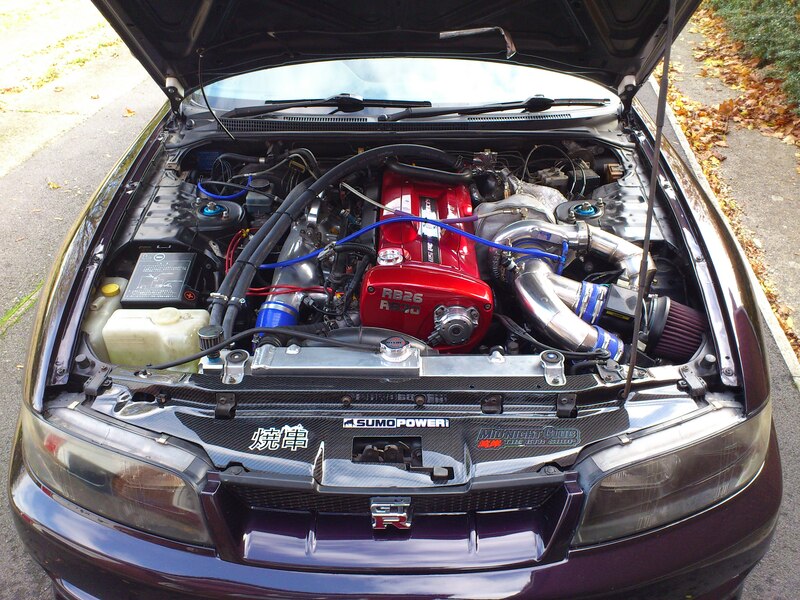 It had always been my plan to fit a vented bonnet of sorts but with the RB30 block being that much taller it creates issues with fitting most. 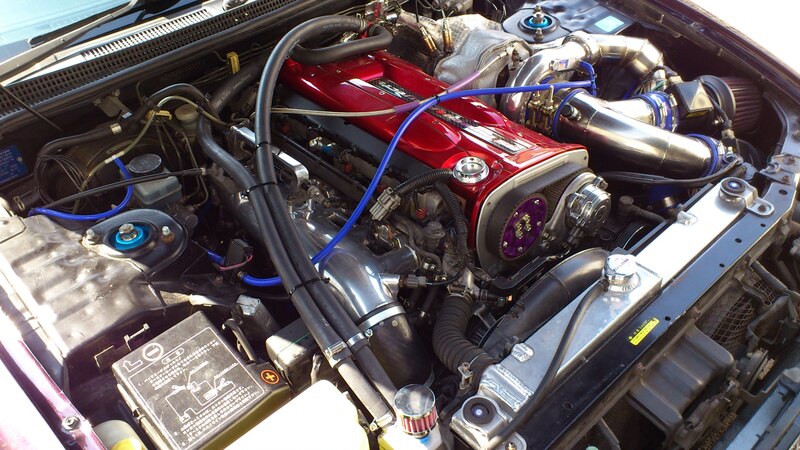 After a bit of asking around on forums it seems like a top secret style one might get pretty close if you allowed it to flex over the rocker cover and rest on the top of the engine. A Jun one could also be an option. Anyway, for the look I made the choice to go with a Top secret one. 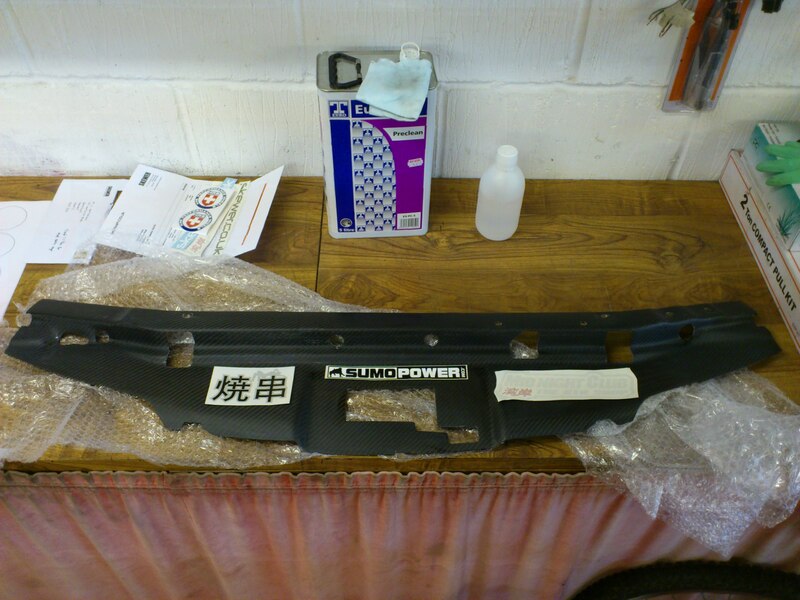 I source a FRP one and when it arrived set about checking the fit. 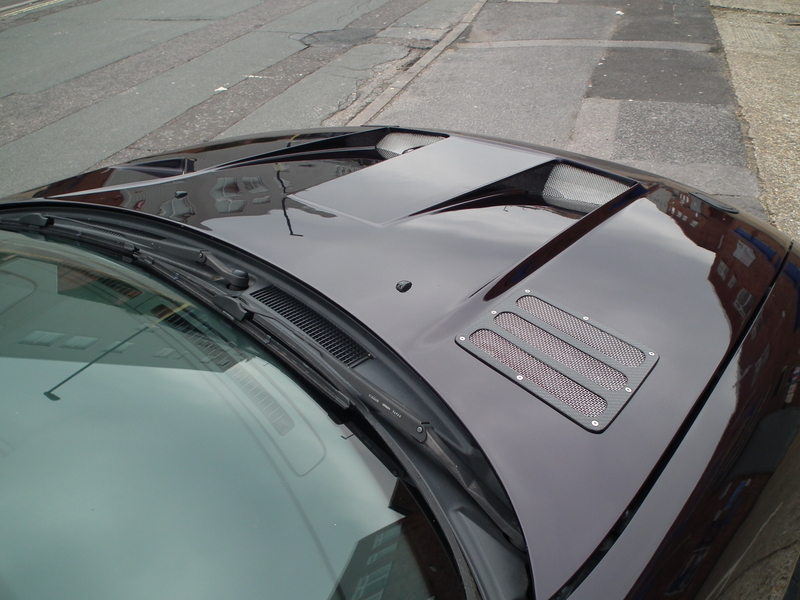 It became clear very quickly that the bonnet would require more than a little flexing to latch down and was some way off doing so. 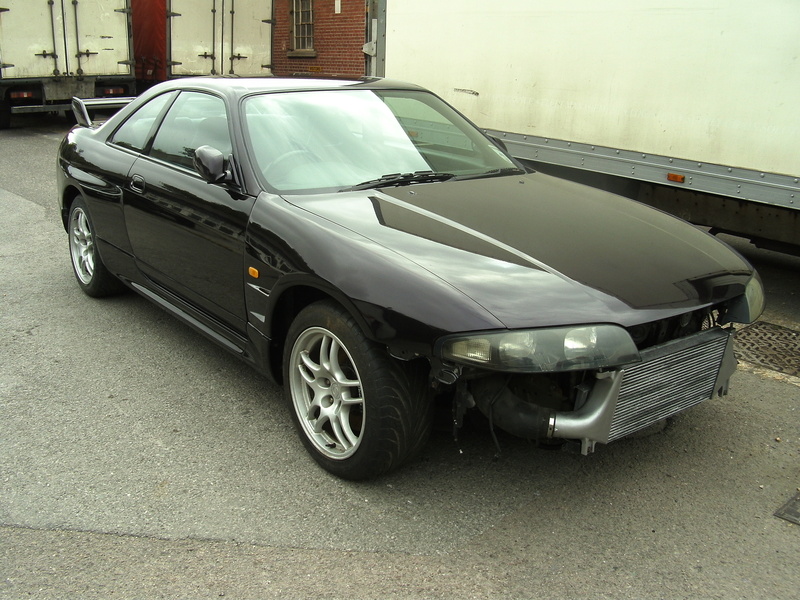 Initially I thought I would have to sell it on and try a different bonnet. 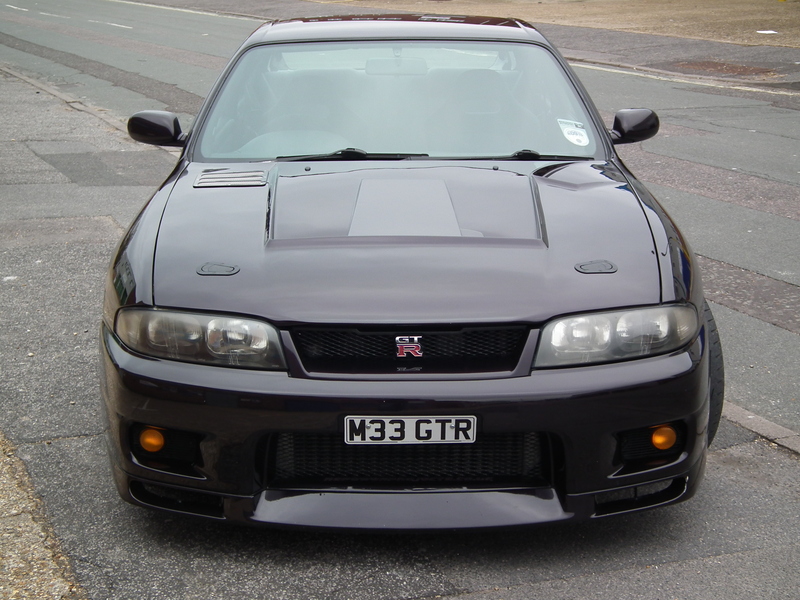 Then after having so time to think about it I decided why not modify the bonnet so it did fit and make a 1off custom one? Well the thought is the easy bit! working out how to go about it and putting a cutter to a very nice bonnet was quite hard and took a bit of time to get around to! 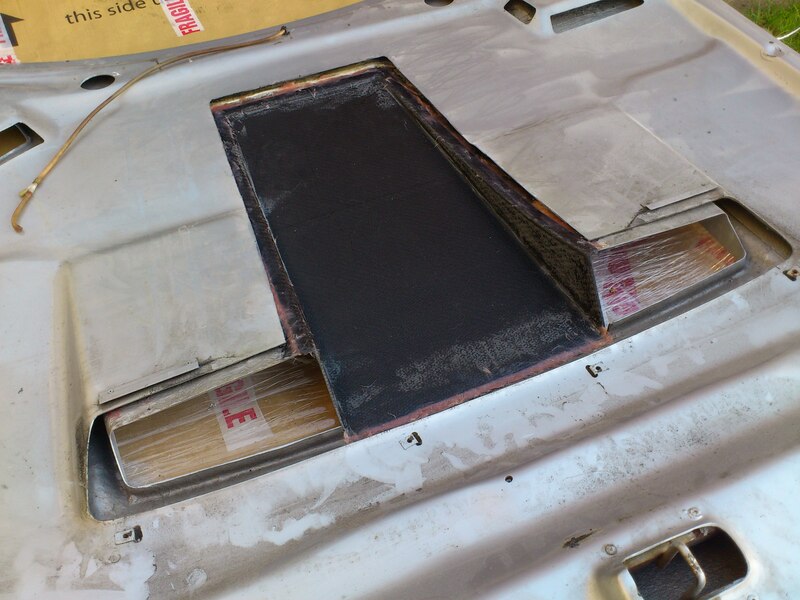 After playing around with bits of cardboard and measuring the engine and bay position I concluded the easiest and neatest way to make this work was essentially to remove the central section of the main bonnet vent where it dips down so that this came back up to normal bonnet level. 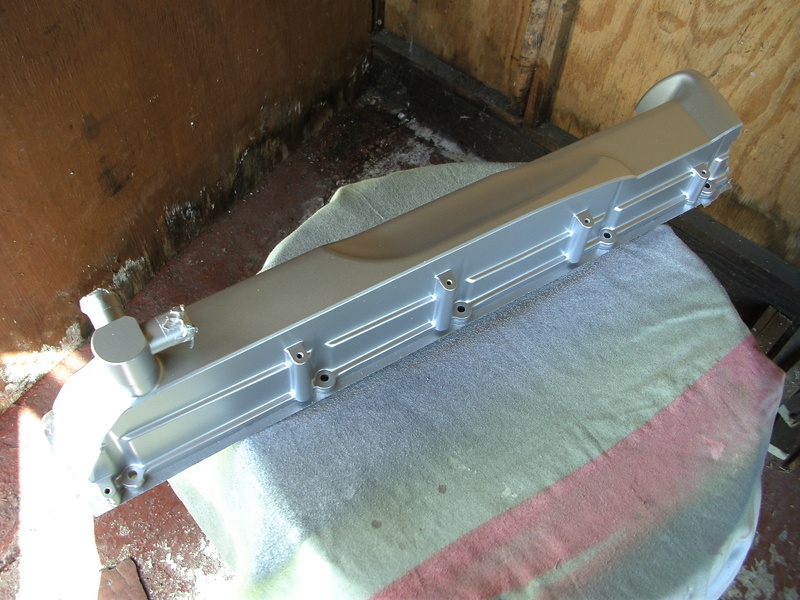 Thus clearing over the rocker cover. 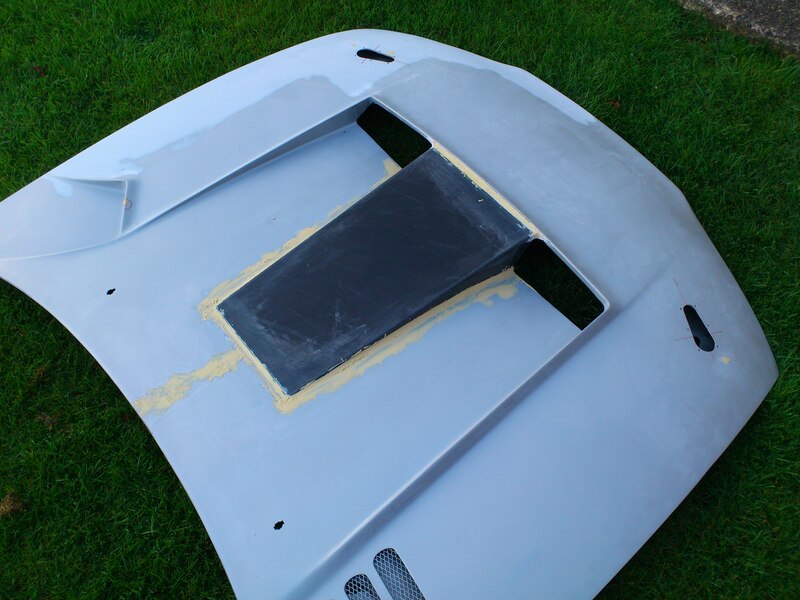 Trying to think of various ways to do this and blend it in I decided the only thing for it was to make a mould tool and make a section that I could bond and blend into the bonnet. 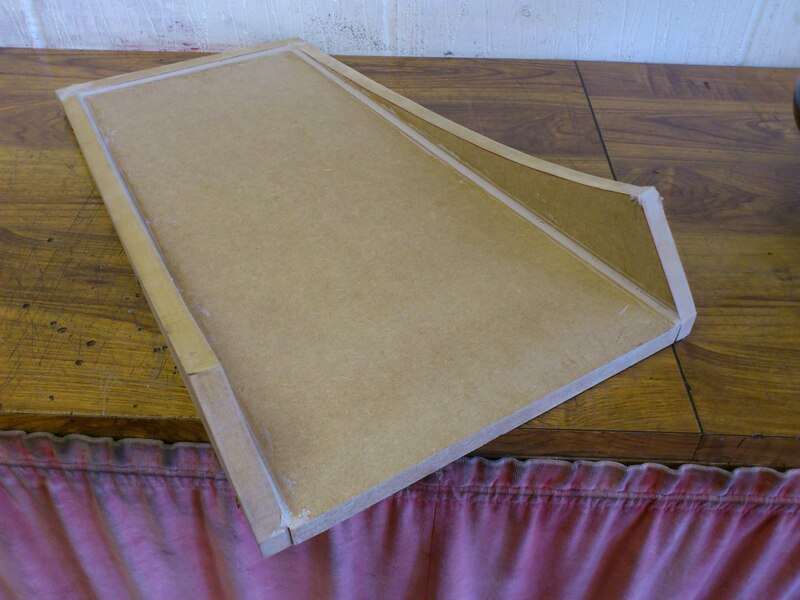 So using some MDF and making templates to check the curvature of the bonnet was matched I knocked up and sealed a tool. 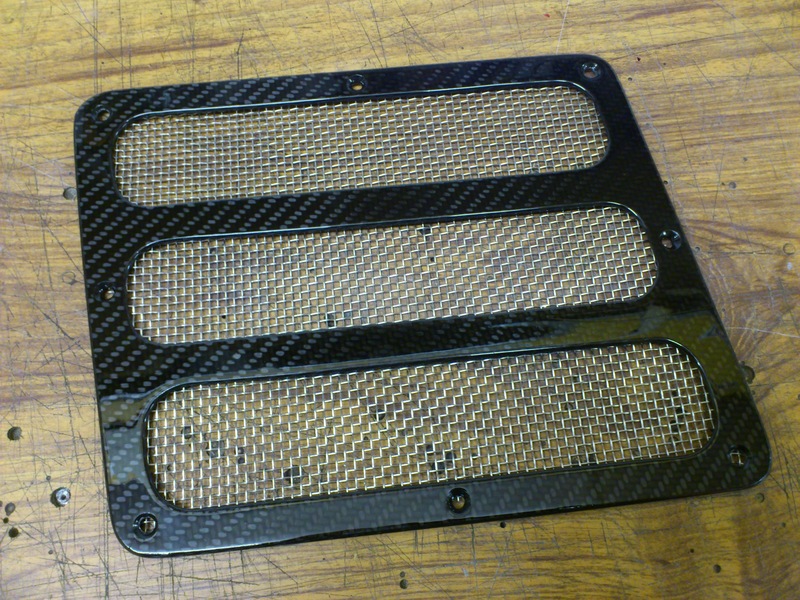 Fortunately I was able to use some off cut materials from work and laminate a carbon fibre scoop from the tool. Which meant is was nice and rigid for quite a thin laminate. 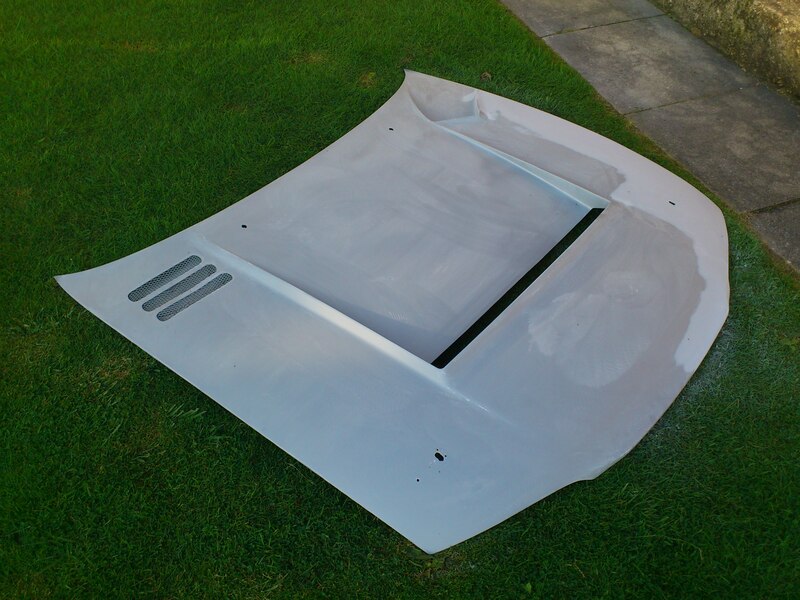 With the initial offer up to the bonnet it looked very promising and I was starting to get more confident with my plan. 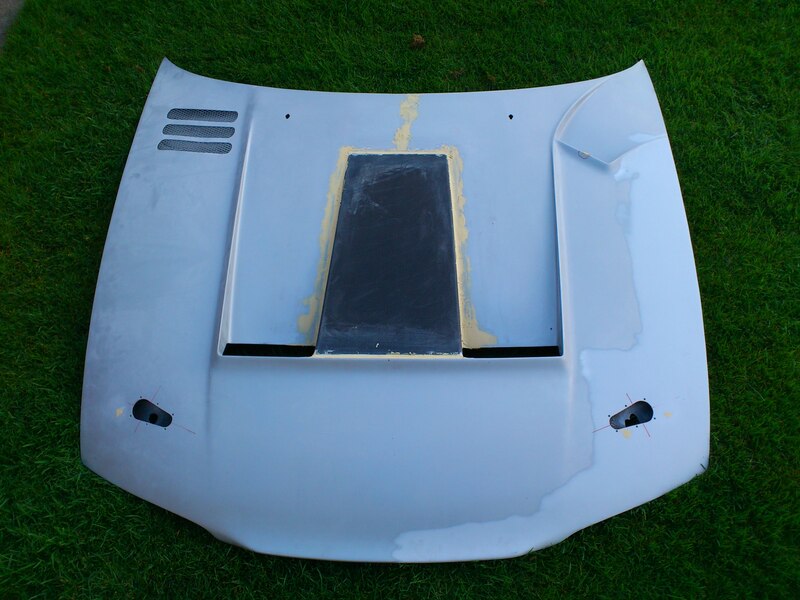 The hard bit now was going to be marking and finally cutting the bonnet! I could not put it off any longer. I was going to have to take the plunge and make the cut! 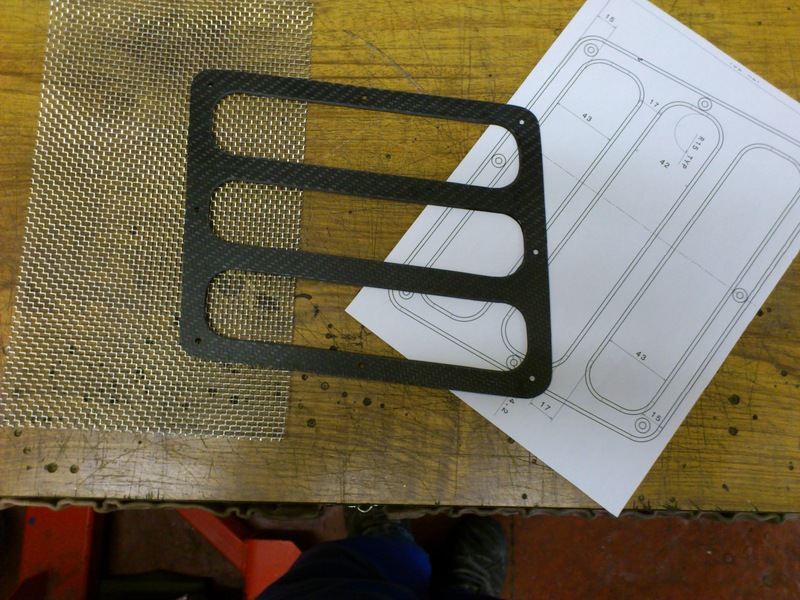 Using a 1:1 template I had for making the mould tool with I marked out the bonnet. 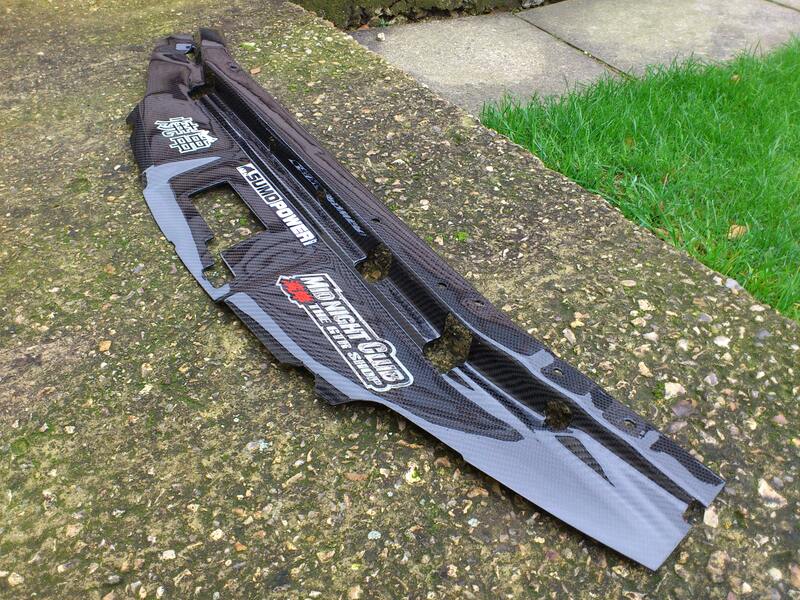 I then plucked up the courage to put my cut-off tool to the bonnet! 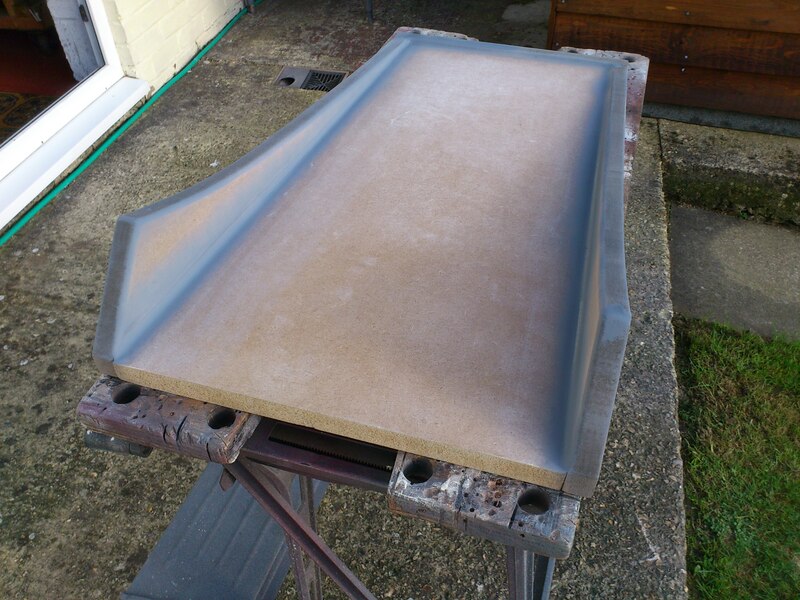 Once I got going I was fine, I found I had to cut through some webbing inside the bonnet skins stopping the panting but nothing too tricky, just a steady hand! 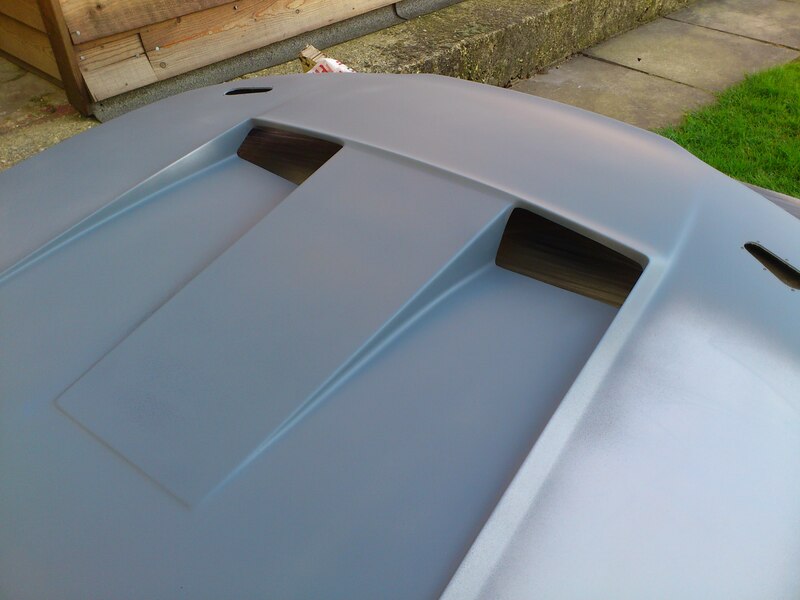 A few minutes later I was offering up the scoop section into the bonnet and to my delight with a little bit of fettling it fitted lovely! 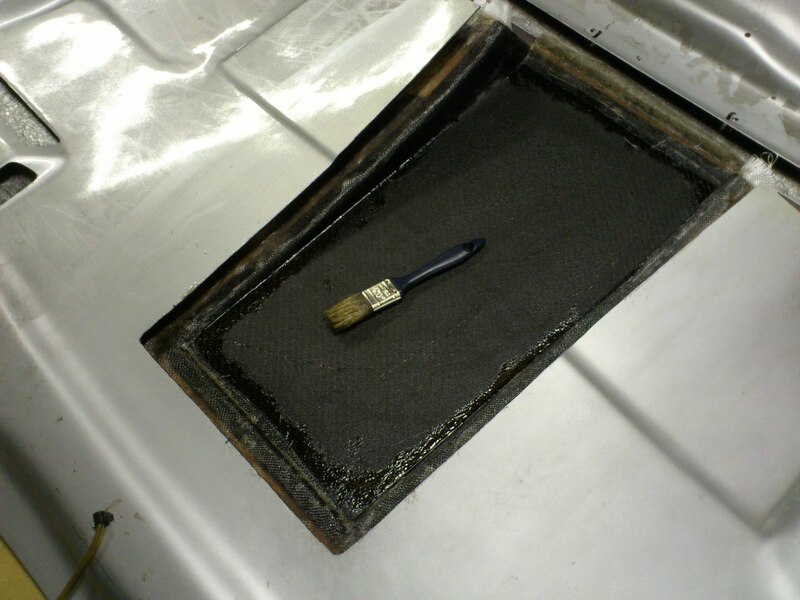 The next job was grafting the scoop into the main bonnet. I intended to graft it to the outer skin and then tie it into the inner skin with additional wet lay. To make life easier for myself I used glass chop strand paste to fix the scoop to the outer skin with some rivets to hold it while that dried. I then reinforced the joint with 50mm wide glass strips and resin until it was all nice and firmly tied into the inner skin. 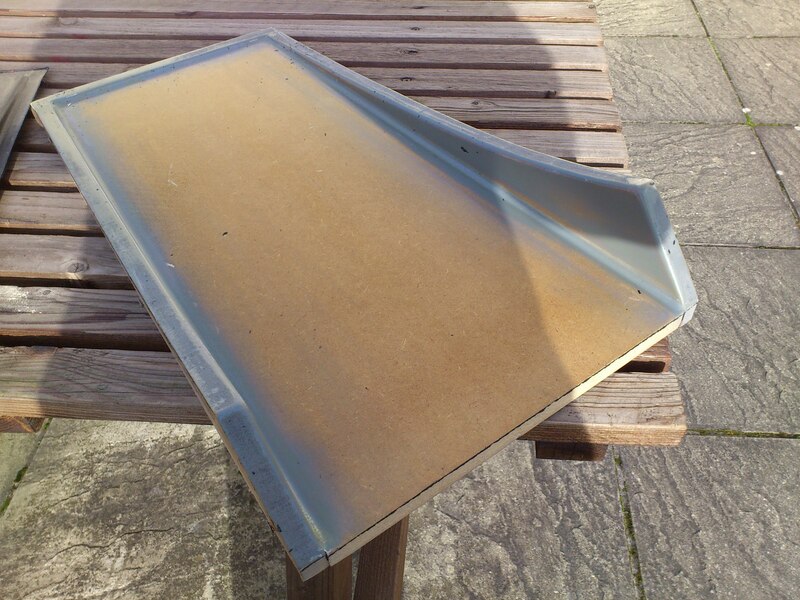 While all my wet lay was drying and I was feeling brave cutting my bonnet I thought I would take the opportunity to cut the holes in place for my Aerocatches which I had not been brave enough to fit to my last bonnet! 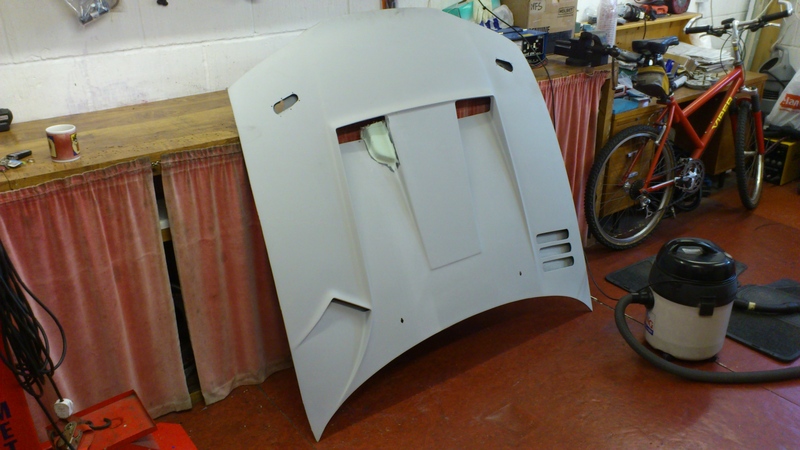 This bonnet already had holes for standard type bonnet pins so I had the centre point to go from. 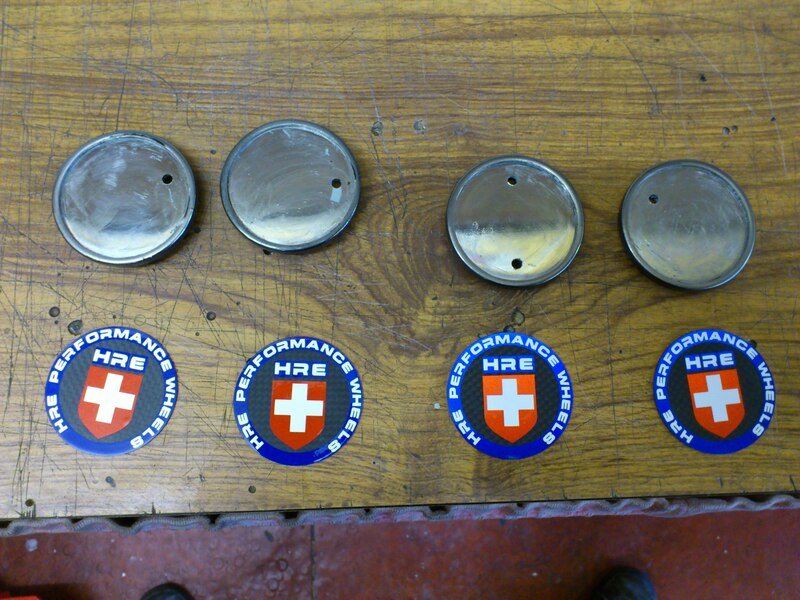 So with a quick marking and double check of the supplied templates with the catches I whizzed out the holes for them! 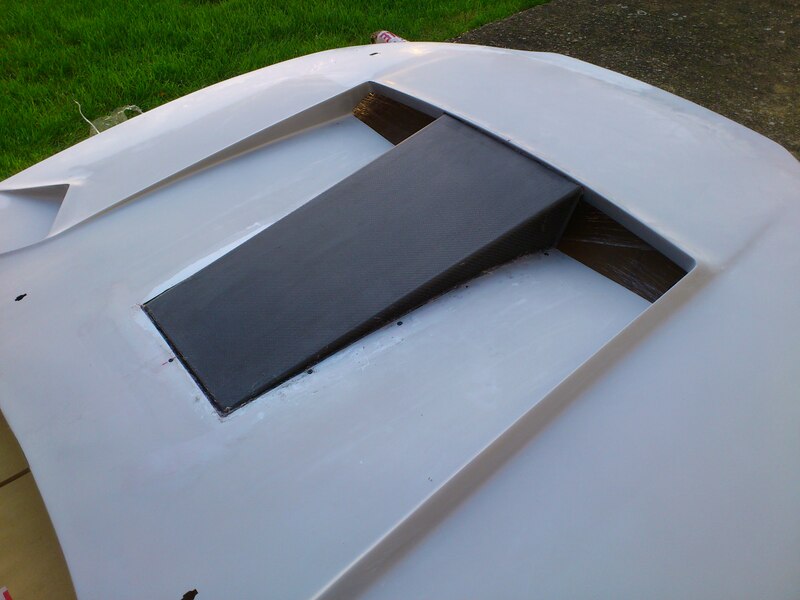 I now had the painful task of blending the scoop section into the main bonnet on the outside so it didn’t look out of place! There were also a couple of other grazes to tidy in while I was at it. 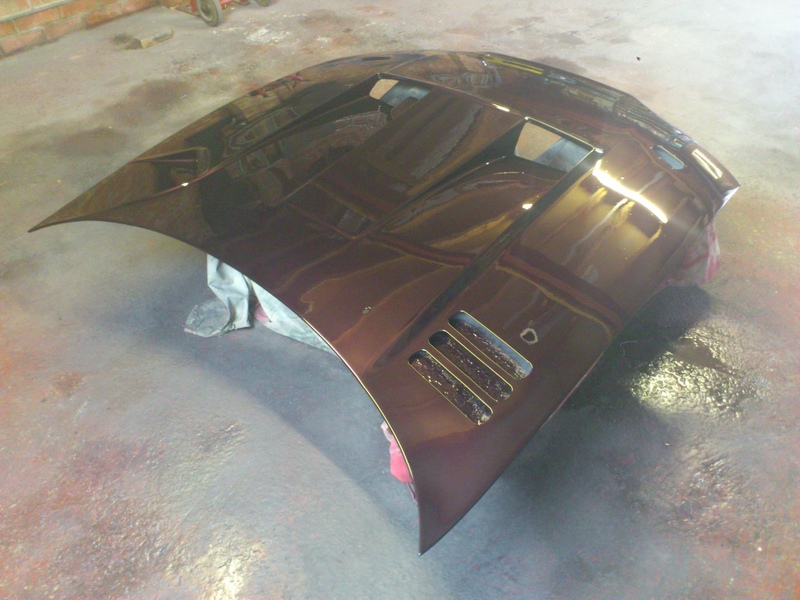 It took quite a few rounds of filler as this has never been a strong point of mine but it got there in the end! 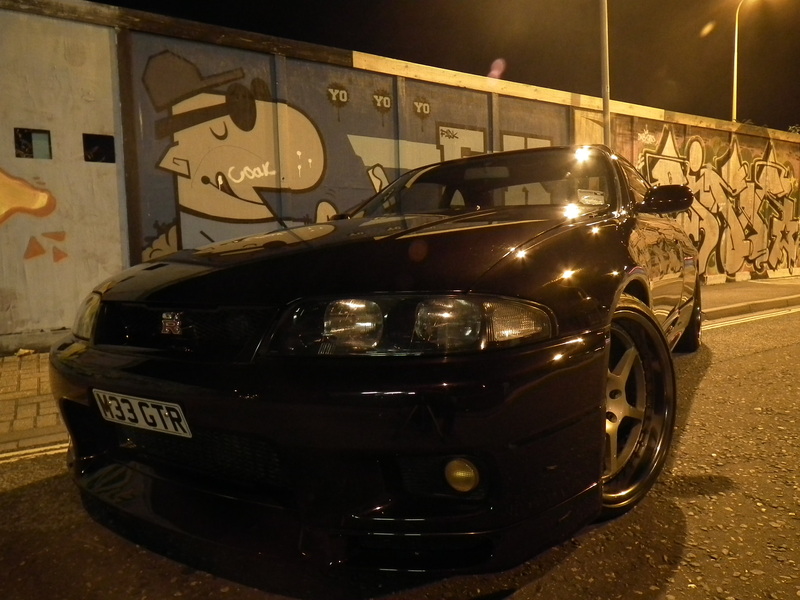 Before I got carried away and painted the modified bonnet a little voice in the back of my head said trial fit it.. So I did.. Oh boy was I not impressed! 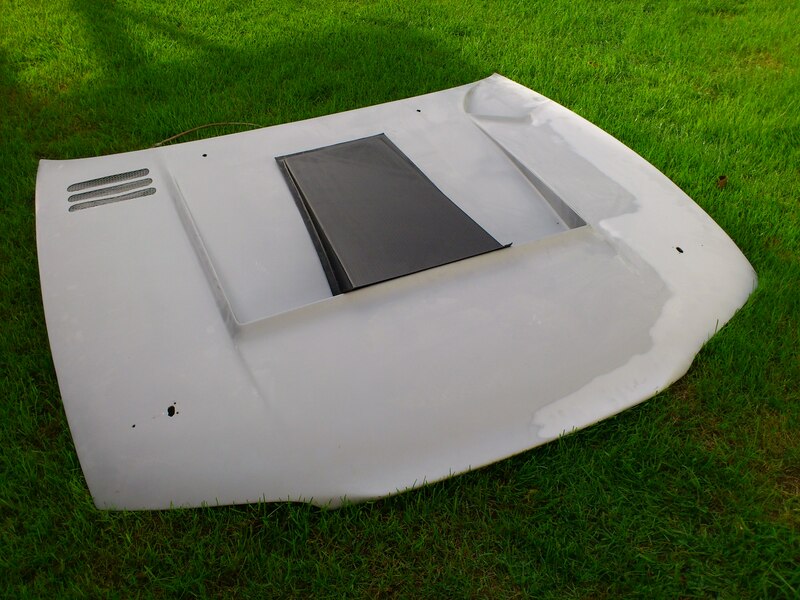 Despite measuring at least twice although the width of my scoop section seemed good it had dipped down about 10mm too much at the front edge and was still hitting on the corner of the rocker cover near the CAS! I couldn’t believe it. 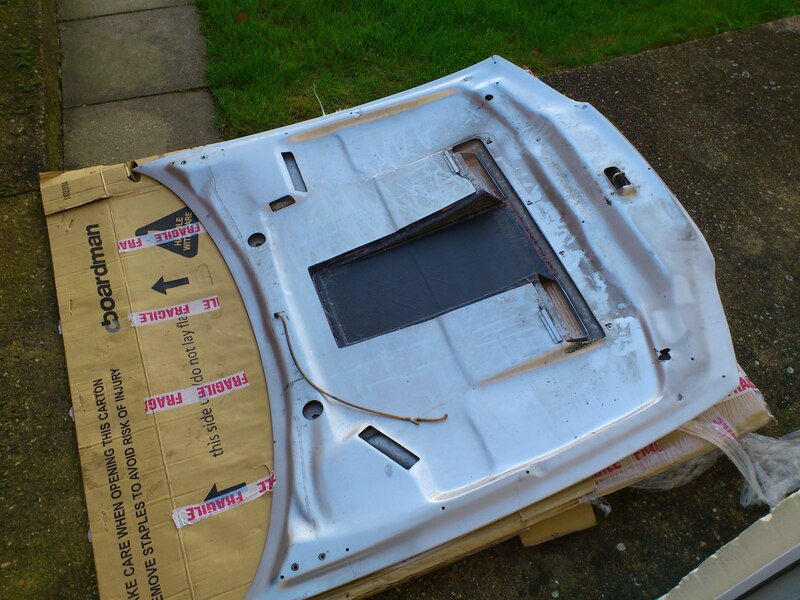 The one thing I didn’t do which looking back now maybe I should have, is trial fit the bonnet after I had cut it to see what was where. Oh well… You Live and learn. 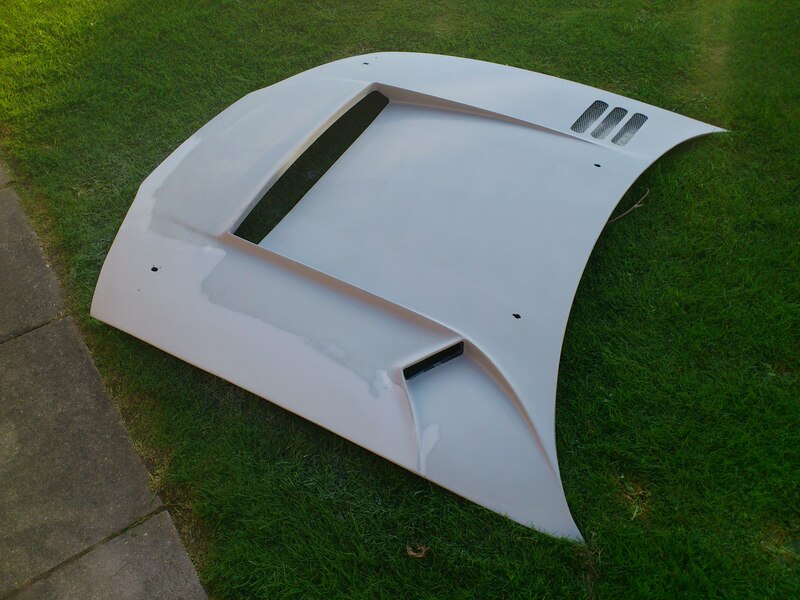 So I had to think of a way to further mod the bonnet without making it look like a complete hash up! I came up with all sorts of ideas but the best I could think was blend and addition bulge in the side of the scoop. I also came up with a number of ideas on how to do it.. but the only way I could see forward that would look sensible was if I was to mock-up a section myself and make another mould! 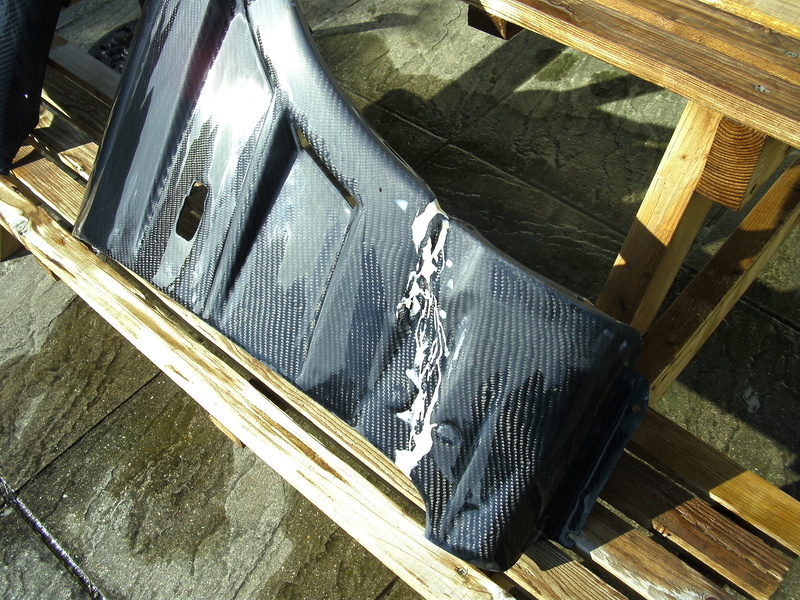 This time I cut a section out of the bonnet where I thought I needed it and then fitted the bonnet back to the car to check it cleared. Once I had got this right I then new the area that I needed to blend in. Of course I shaped it up a bit as well! So I grabbed some modelling foam and set about making a shape that filled the gap and blended as best as I could with the rest of the bonnet. 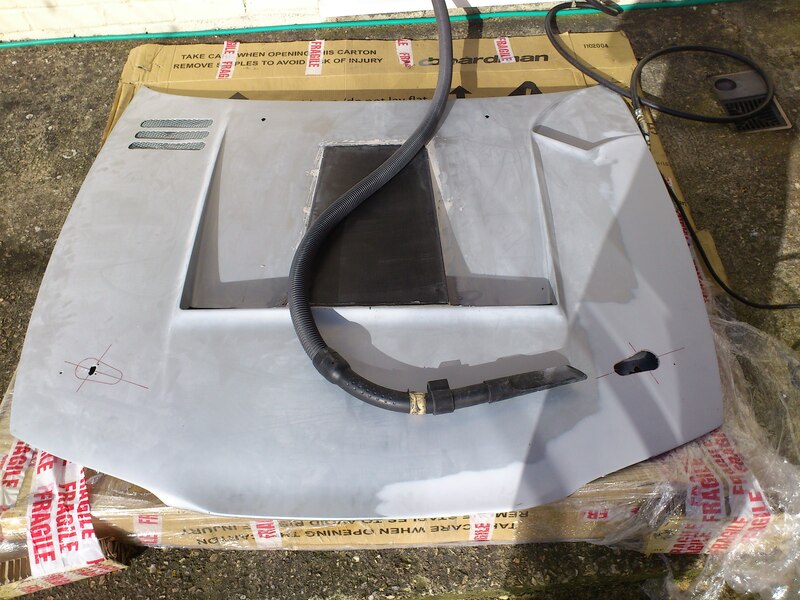 Once that was there I taped the block in place on the bonnet and covered it with some PTFE tape to prevent the moulding material sticking to it so I could take a GRP moulding off of it. With that done and successfully released I then did the same with the mould and grafted a section directly into the bonnet. With the mould released off it and some filling and blending it took shape quite nicely. Each to their own but I didn’t think it looked too bad! Then with a bit more filling and blending and a final trim up it was looking just peachy! A quick and final test fit to make 100% sure is was good and I was ready for the final paint! Painting is one of those jobs I love but equally hate! When it goes right the results can be so satisfying but when it goes wrong it can turn into a complete ball ache! Although you can still usually get that top result at the end, it requires 10 times the effort to get there. 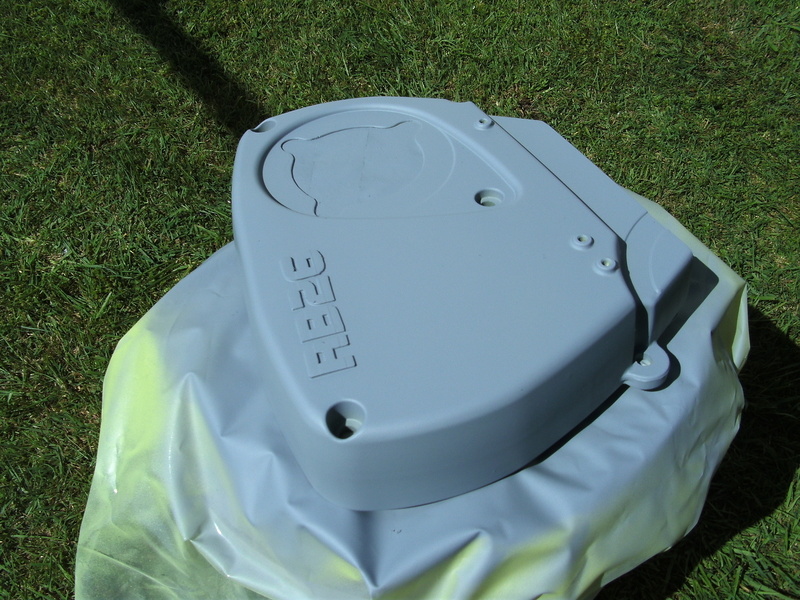 Well as they say about a lot of things it is all in the preparation and that certainly applies to the paint. 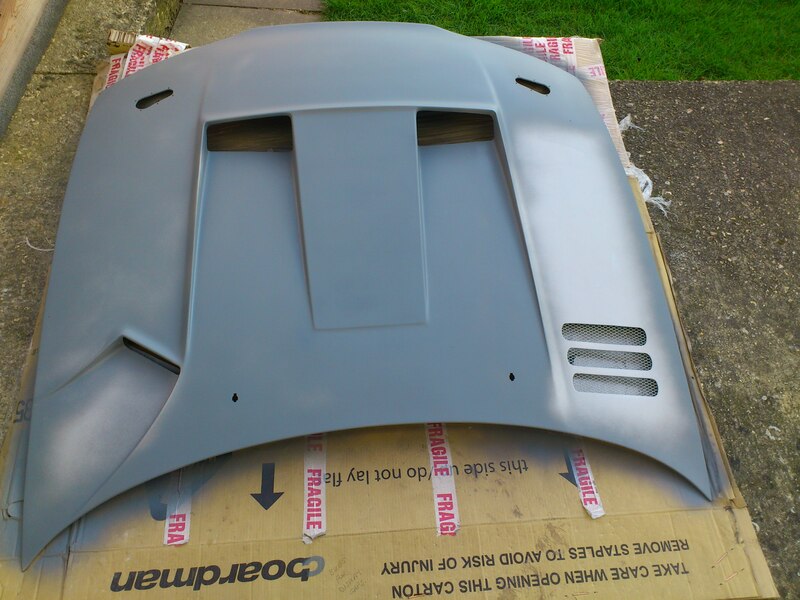 So I tenderly cared for my bonnet, giving it a coat of 2K primer and loving flatted it down. Then continued to thoroughly massage every inch of it with degrease and dust it clean with tack rags. I think you can agree the perfect prep. I must say my spraying area is not the best being just a regular garage but it normally does the job. 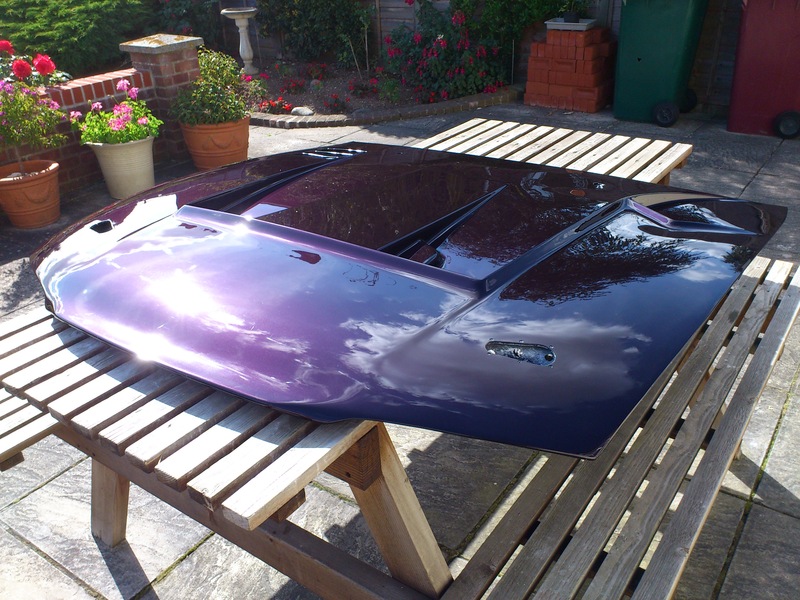 So I set-up and rested the bonnet on some drums and mixed up the midnight purple ready to go.. A quick test spray with the gun and off I went. The colour itself went on a treat. nice and even. Good job. I cleaned out the gun and mixed up my 2K lacquer and possibly this is where I made my first mistake. The thinners I was currently using was a medium instead of the fat I usually use and I had noticed the paint taking a little longer to dry off than normal. Nothing that could not be solved with my spacer heater mind! After letting the base coat dry off for a while I wet down the floor of the garage to minimise the chance of any dust kicking up and then cracked on with the clear lacquer. The initial dusting went fine then as I completed the second heavier coat I noticed I had a few patches of pin holes in the paint. few bits of crap had either got through the gun or out of the air as well but minimal. it was very annoying as the finish was like glass other than that.. I was not sure about the pin holes but I thought they must be solvent coming through from the base coat maybe? They weren’t really fish eyes or repelling. I took the decision I would leave it a few minutes and try and and flood them in with additional paint. Possibly my second mistake! I must say it did work to a degree but then it also resulted in loosing some of the perfect shine I had and getting a slight orange peel in the finish. I could tell I had my work cut out in the flat and polish now! Blood, Sweat and Elbow grease! 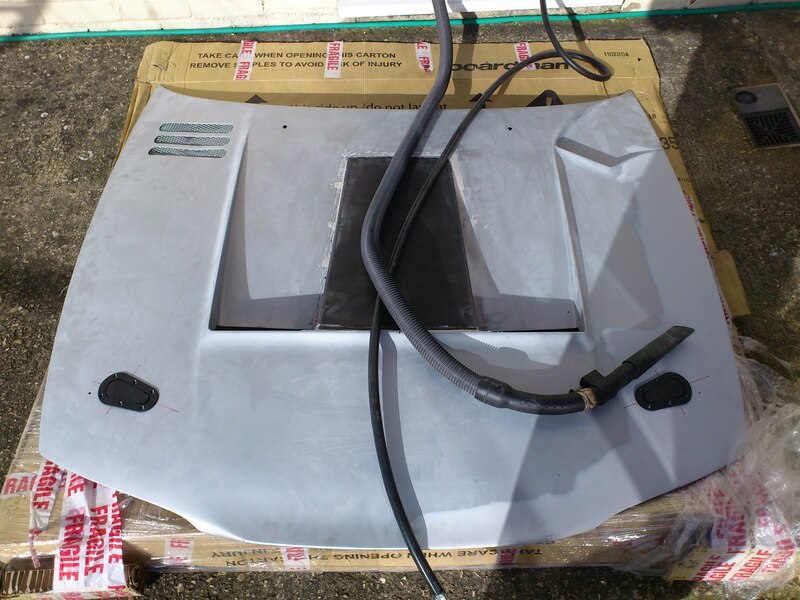 Okay so there was no blood but man was thee some sweat and elbow grease.. No joke I lost 6lbs flatting and prepping the bonnet to get that glassy shiny back and for most of it I was using a DA sander! Probably not helped by the fact I use super hard anti-scratch lacquer! might have to stop that! At the end of the day it comes down to the end result and I was pleased enough with that! 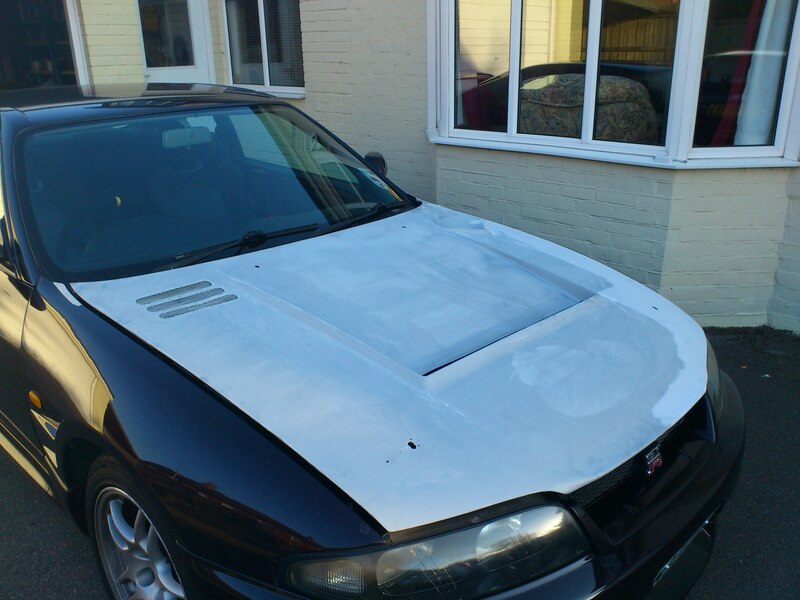 So last thing to do to complete the bonnet is fit some mesh and my Aerocatches and get it on the car! 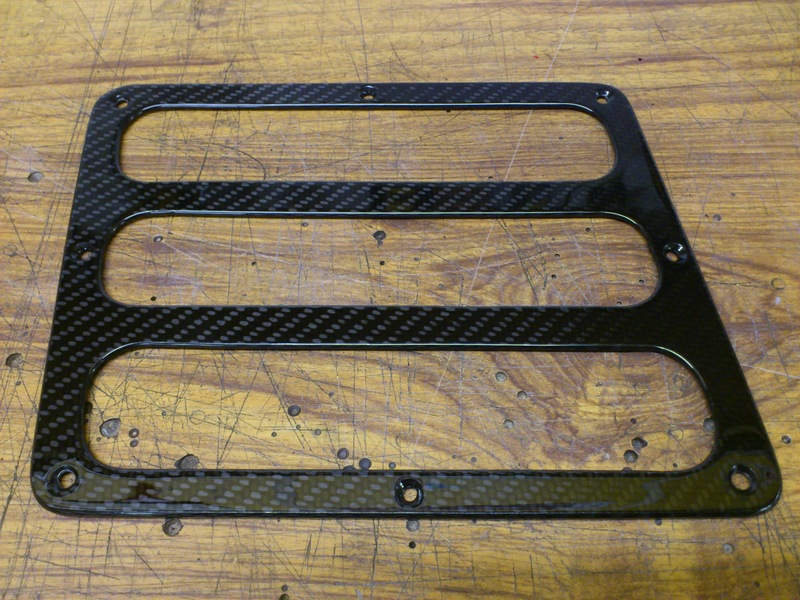 Due to the grilled area on the bonnet looking a bit distorted and weak I decided to make a carbon grille section to mount over it to give it some reinforcement and a bit of bling!! 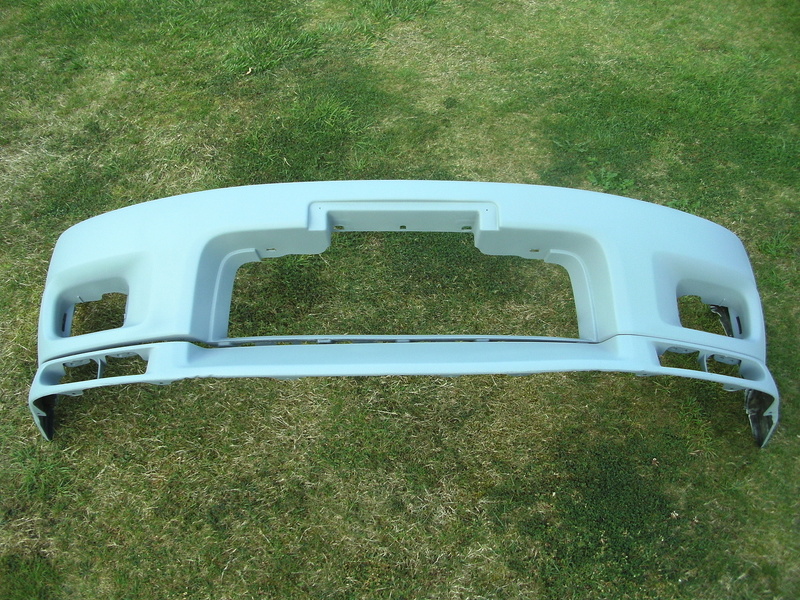 I got some off-cut’s from work and cut a framework for the grille from it.. On the reverse I then doubled up the thickness to allow a frame for the mesh to sit in on the back so it would mount nice and flush with the bonnet. I then chucked a nice heavy coat of lacquer on the frame to bring up the carbon finish. Finally I bonded in the mesh on the back using some seam sealer and job finished! 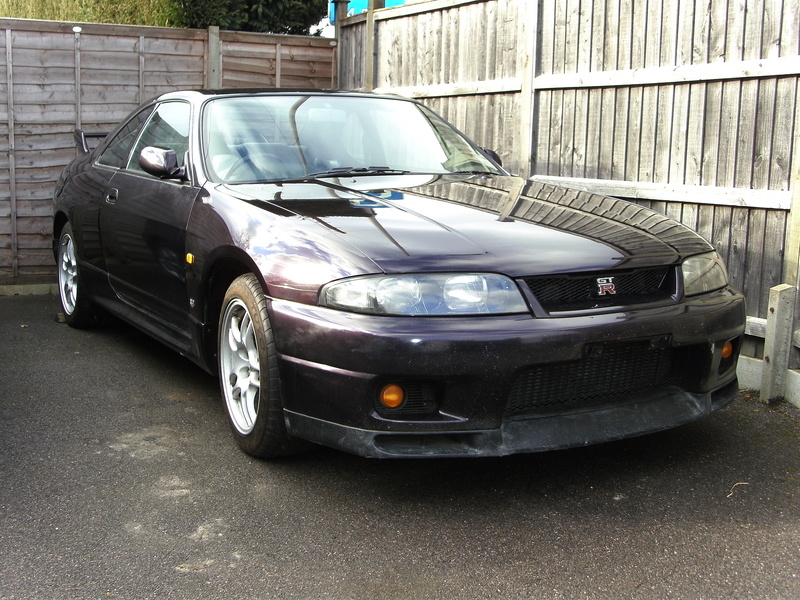 I will get the bonnet fitted soon! 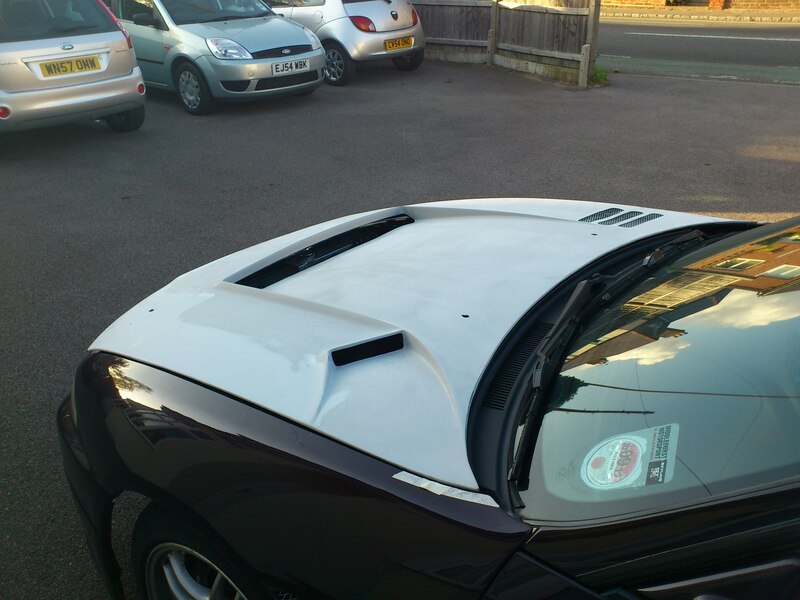 Okay, so I finally got around to fitting the bonnet! To be fair it is a two man job really and this was the first opportunity I had someone around to help me and had some spare time in-between getting bits done on the Mazda! 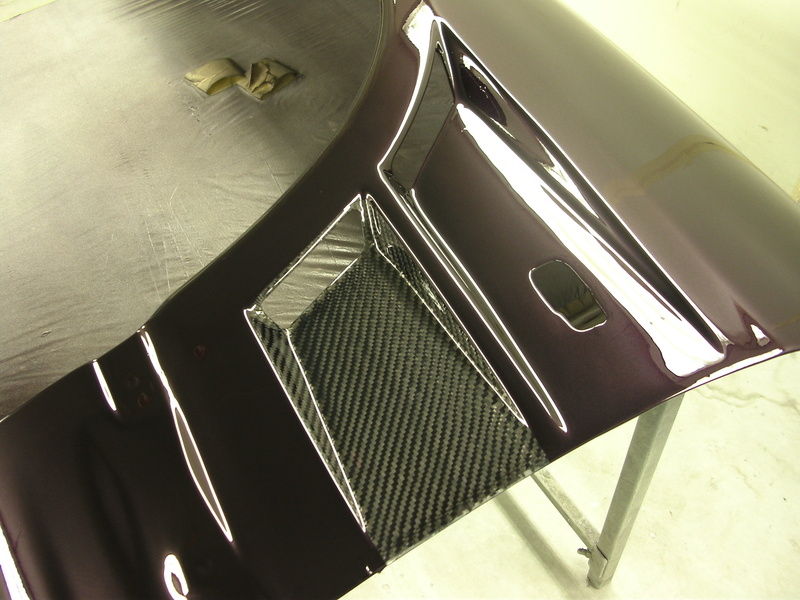 I was pleased with the finish fit of the grille section and the bonnet adds a bit more aggression to the front end of the car! … And there is was done! Plenty more pics in the slideshow on the main page (here) showing the finished article. Hope you enjoyed reading the build!